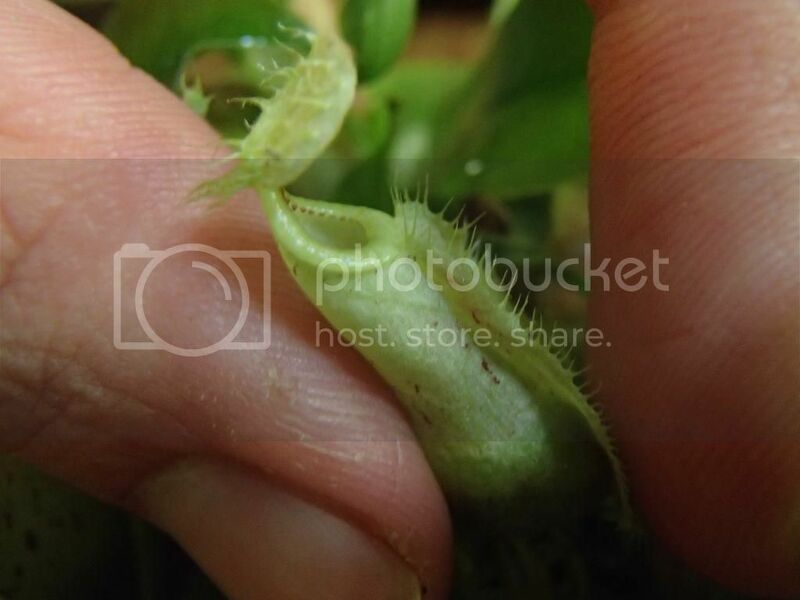 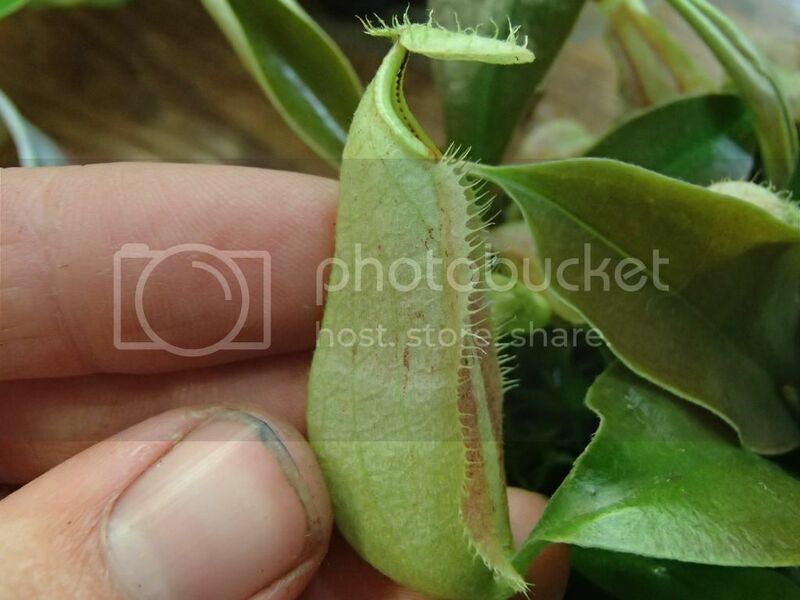 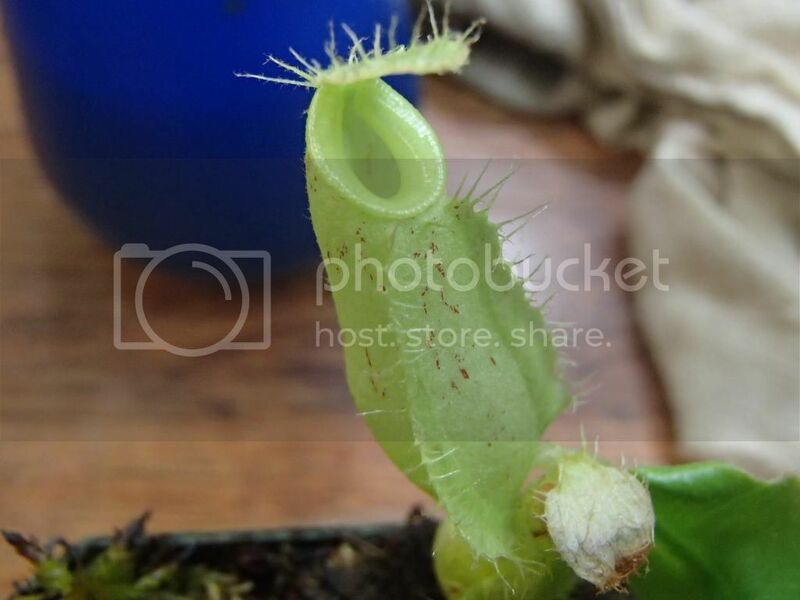 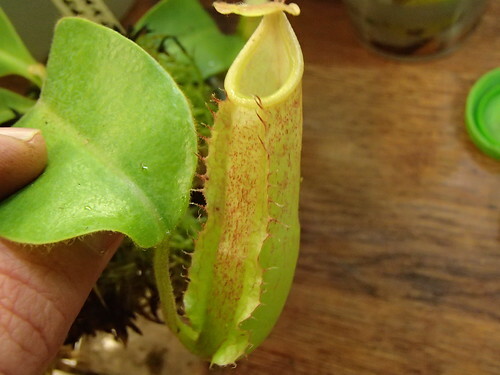 the biggest of my 5 N. beccariana "red"
Impressive clip x (clip x eymae). 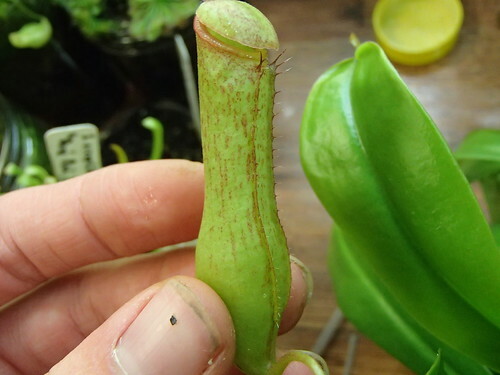 It doesn't have the best leaf to pitcher ratio, does it? 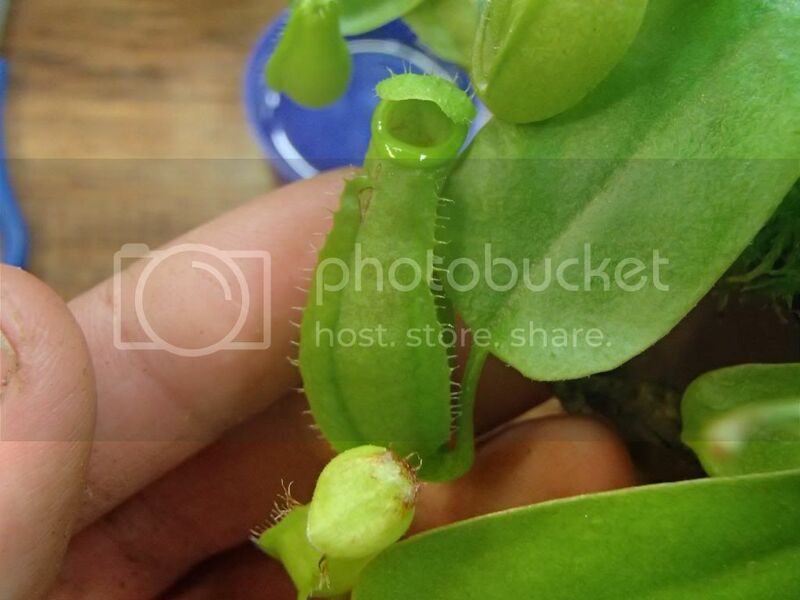 I love those seedlings, cute little things. 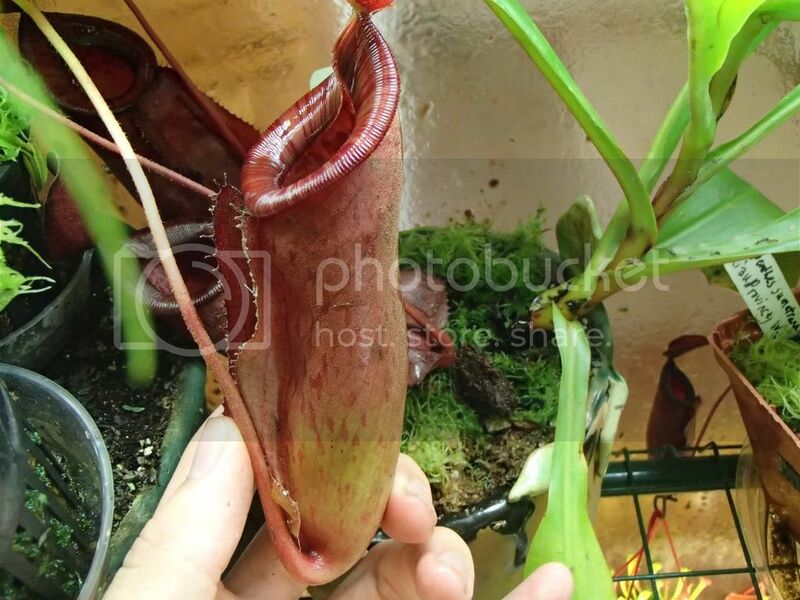 It should have a better ratio, but my plants are constantly bumped or moved around. 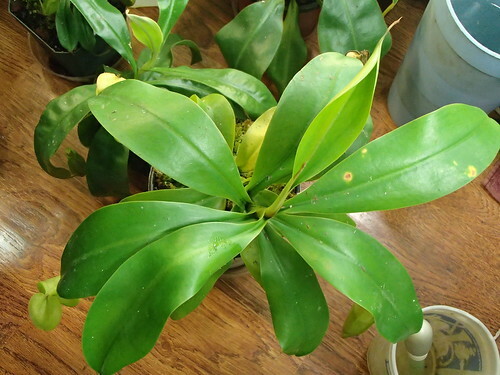 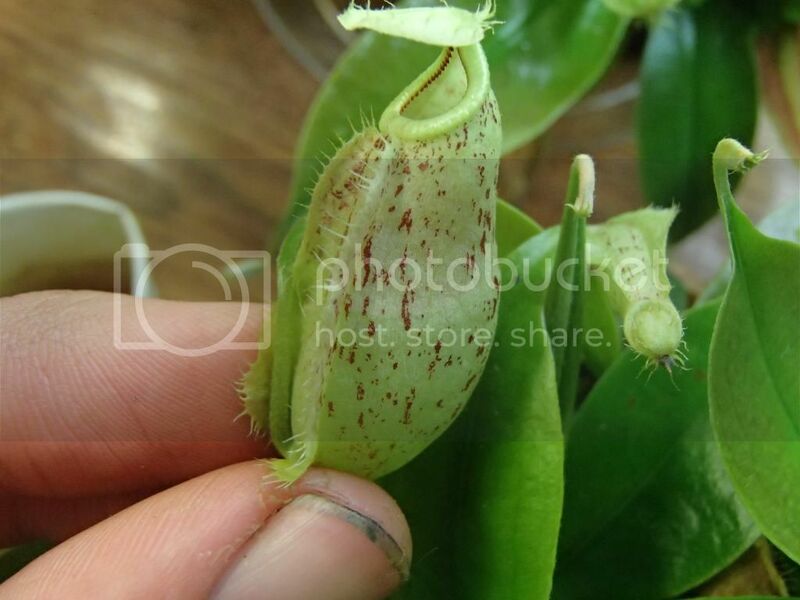 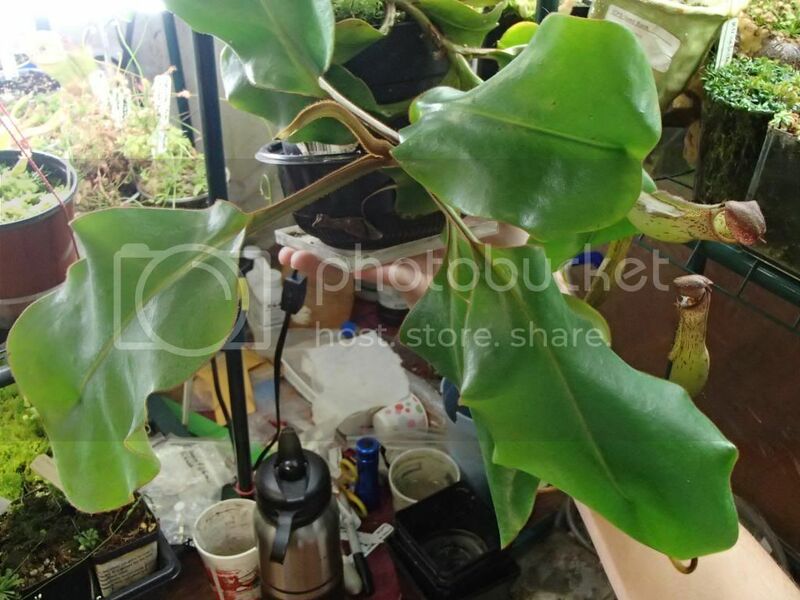 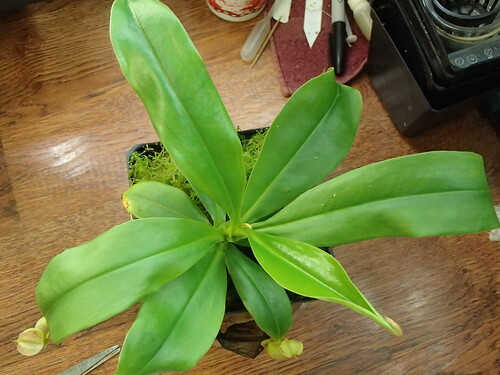 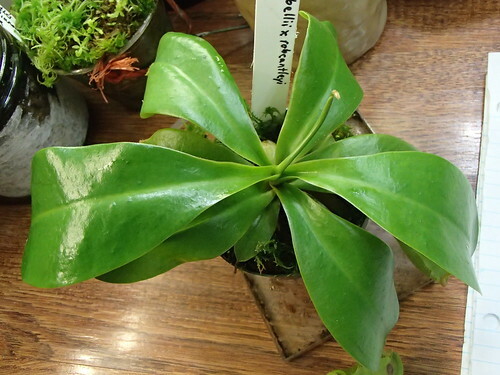 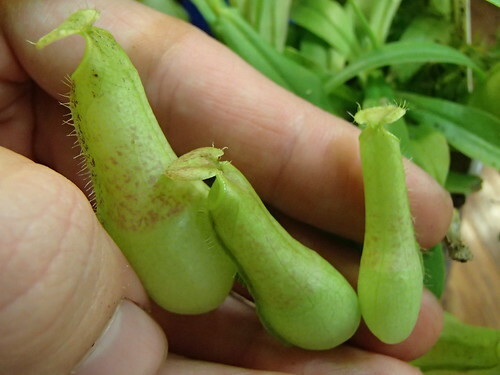 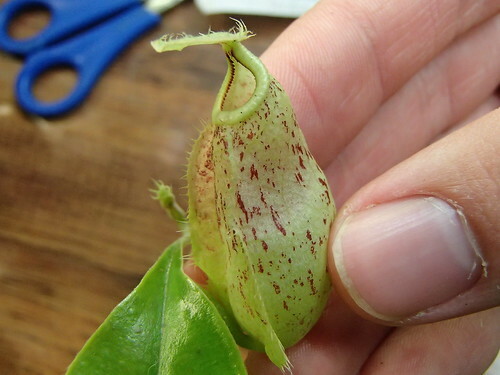 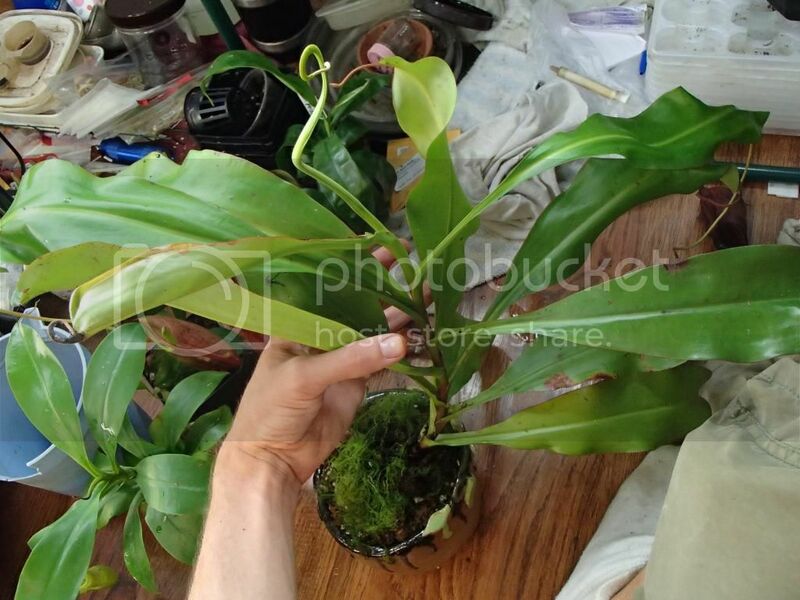 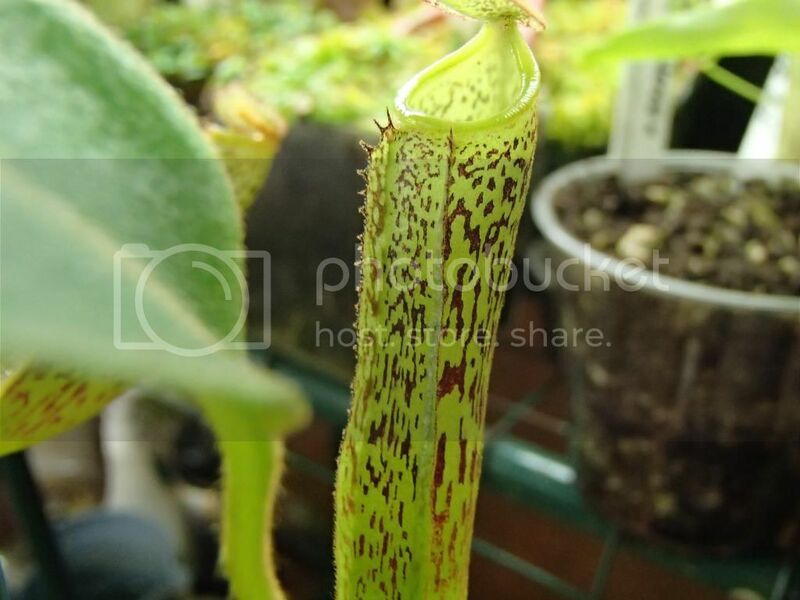 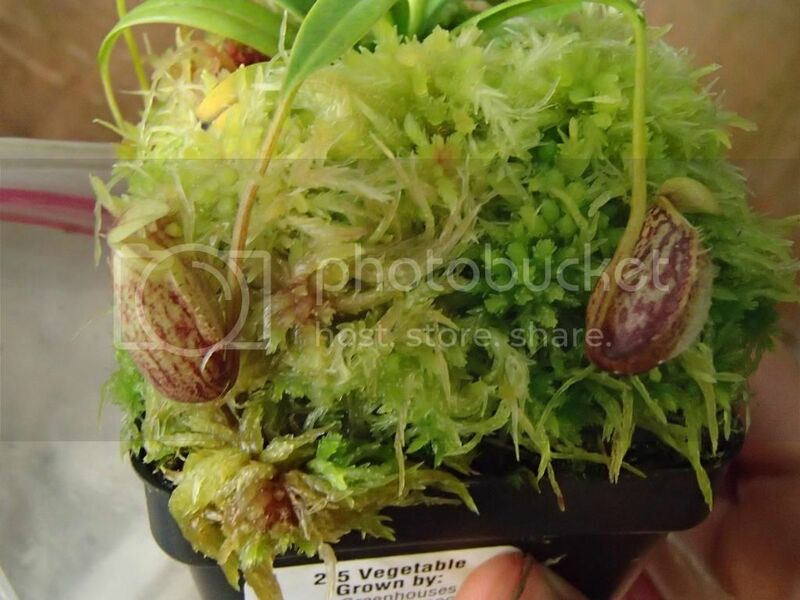 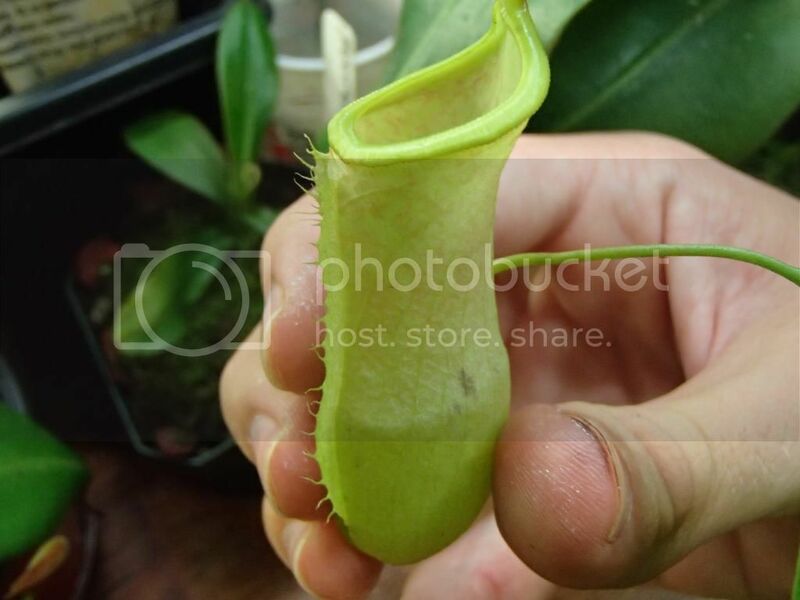 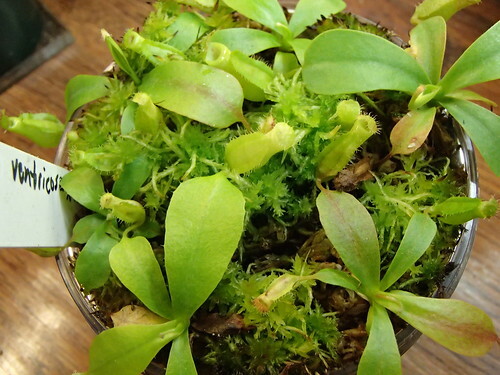 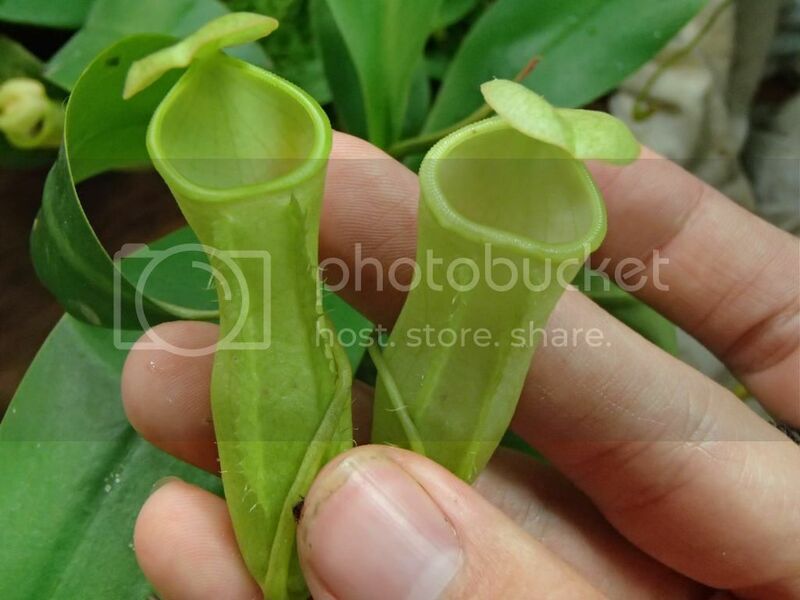 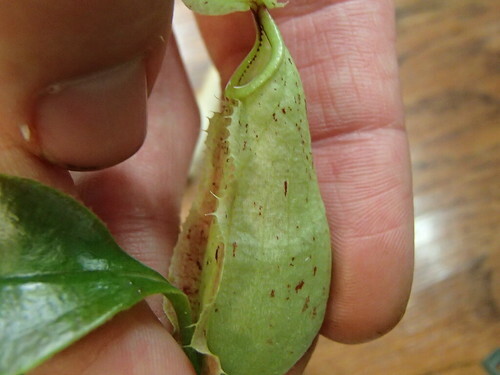 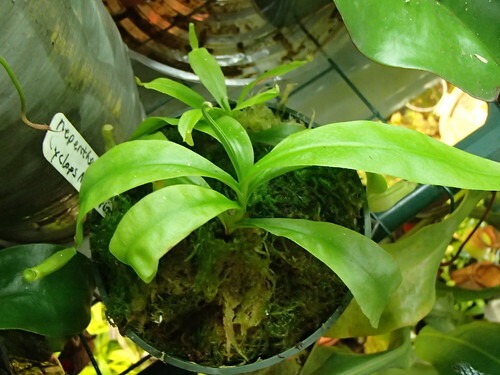 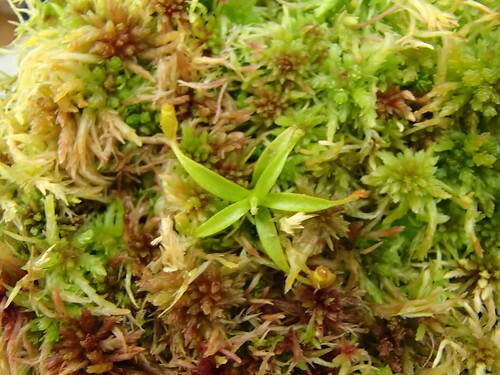 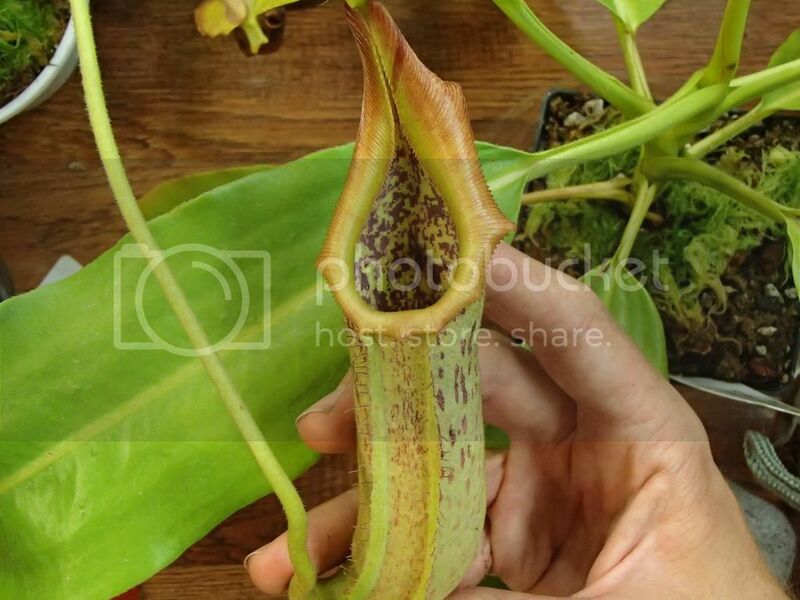 At any age, N. vogelii is a great plant. 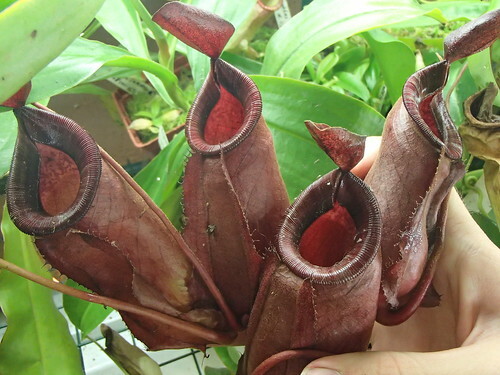 Also, what is the parentage of N. 'Lang'? 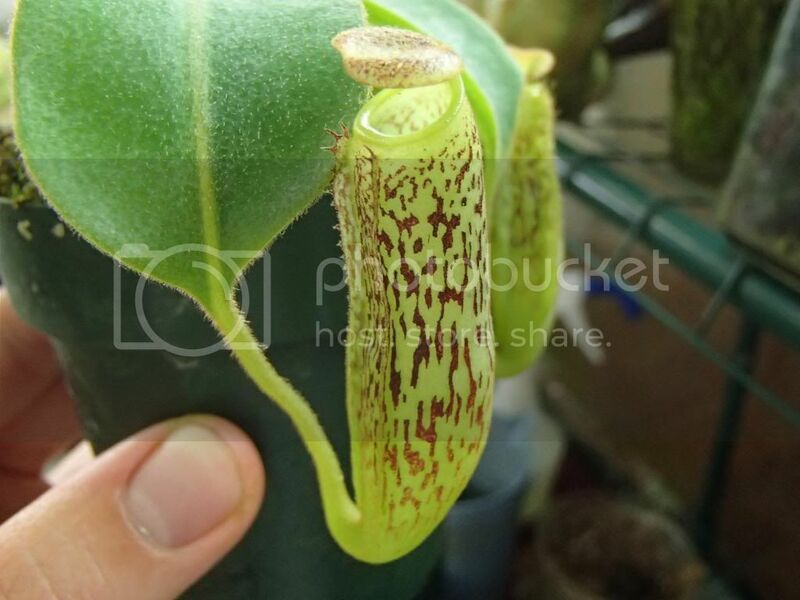 Not the biggest, but one of my largest plants: N. ampullaria 'Harlequin'. 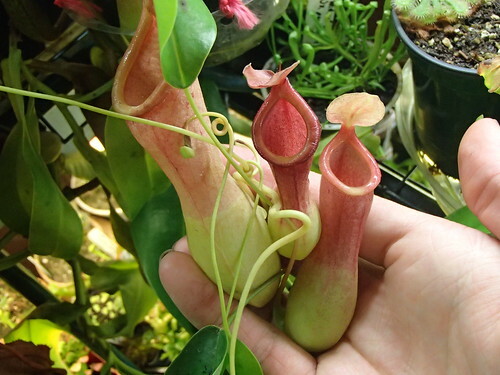 The main vine is over 5 feet long, the other two at least 18 inches to 2 feet, and an unknown number of basals. 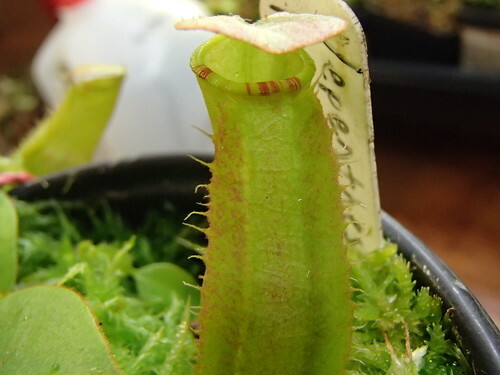 And beccariana "red" with stripes! 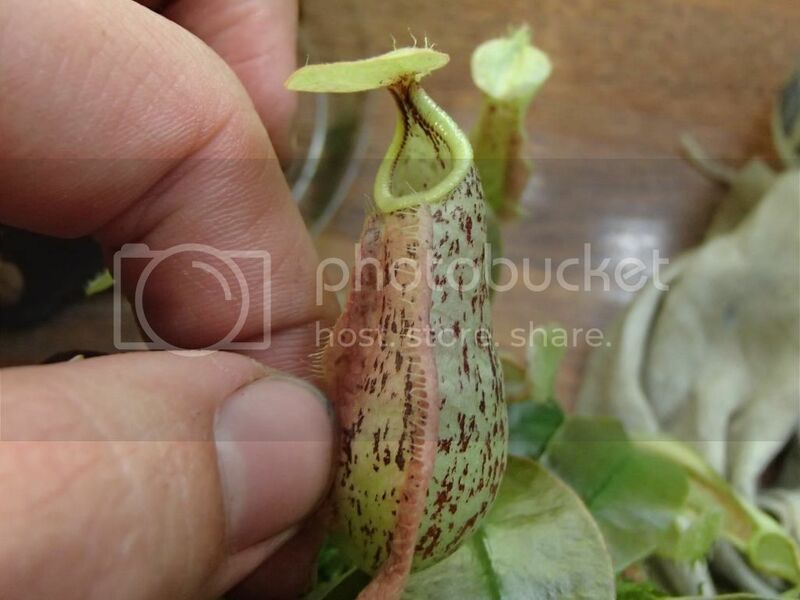 More shots of the keeper rafflesiana "dark brown parent," as many are maturing more. 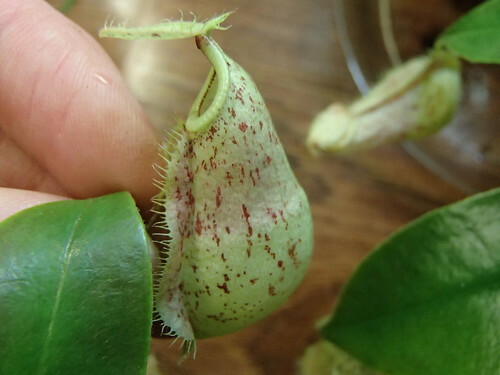 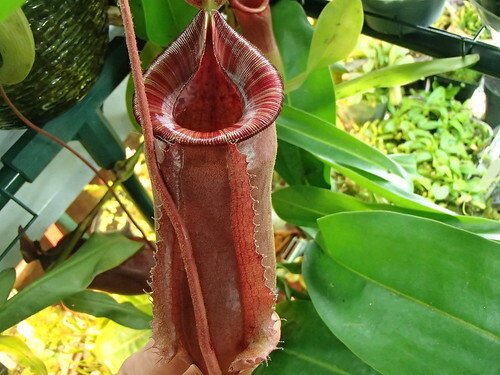 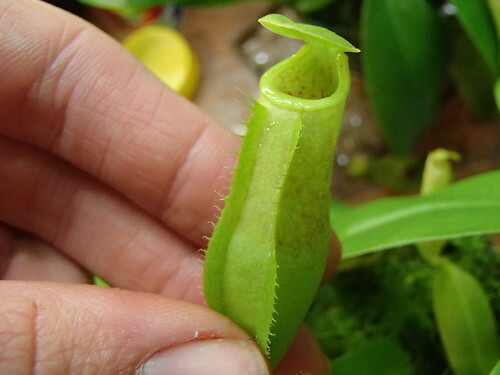 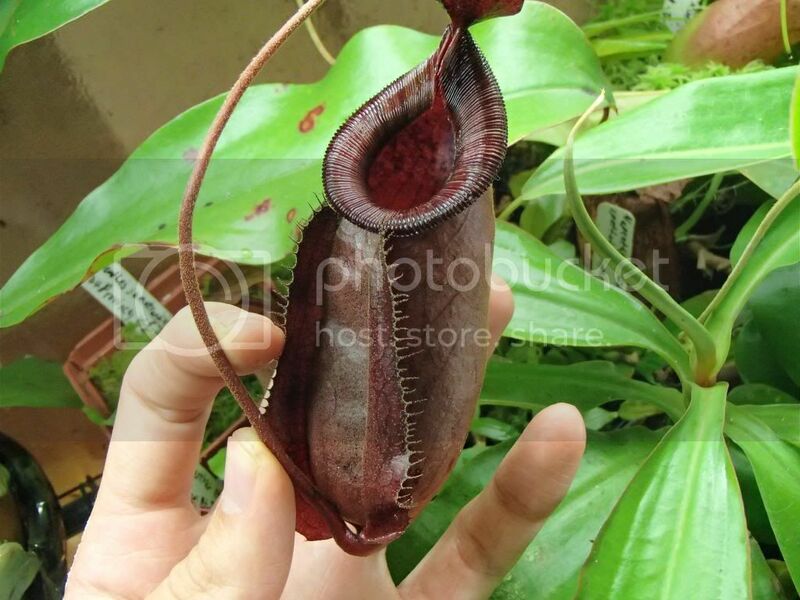 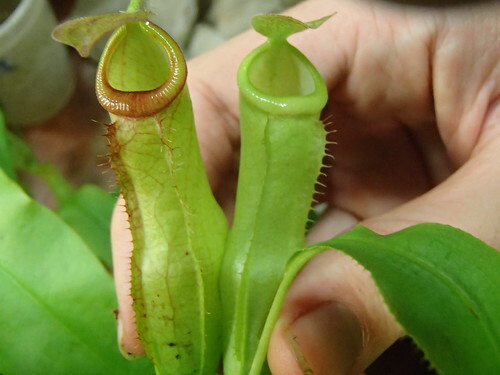 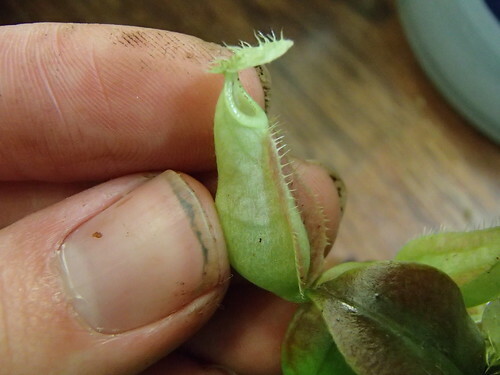 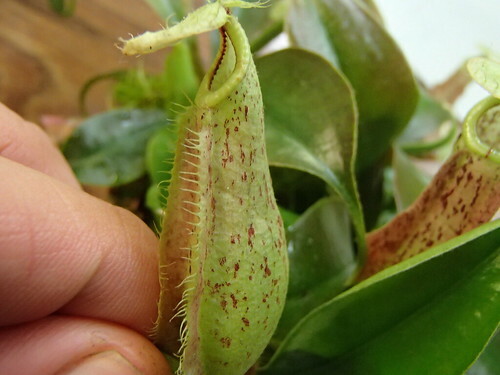 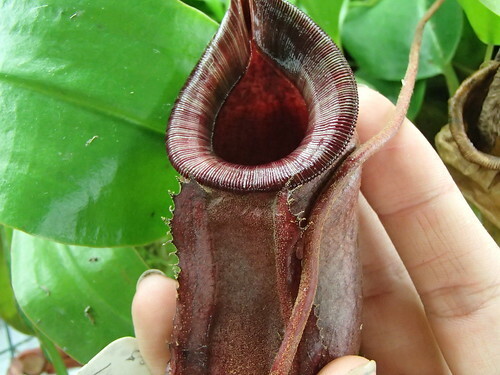 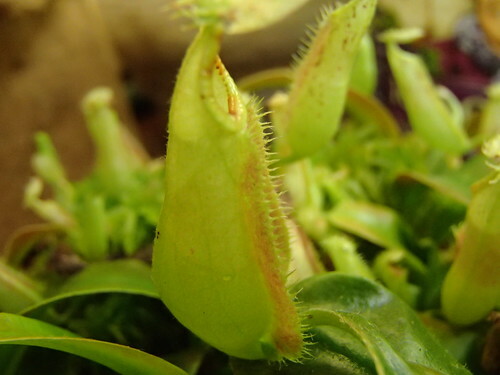 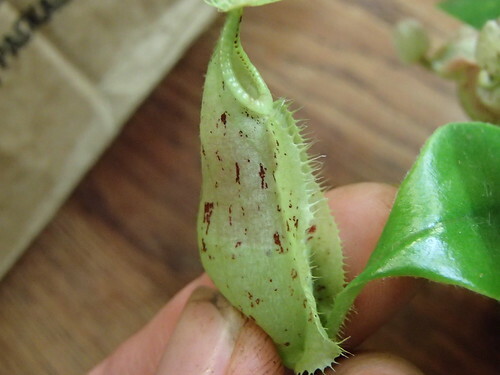 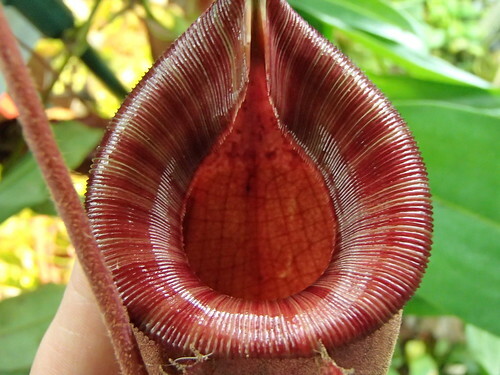 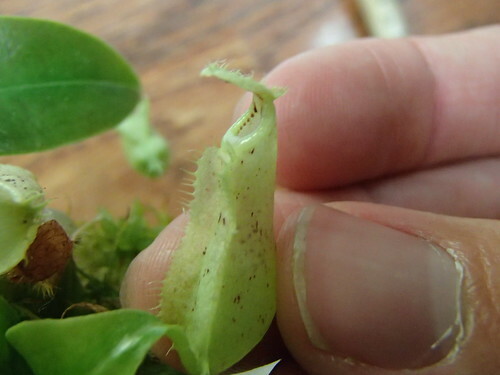 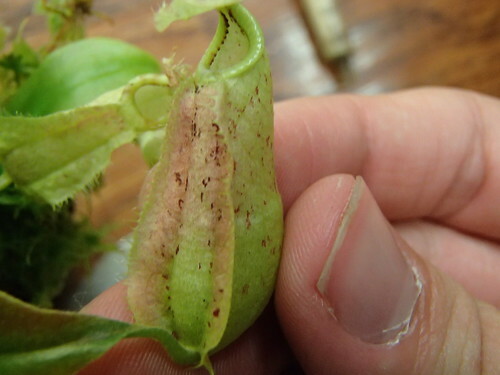 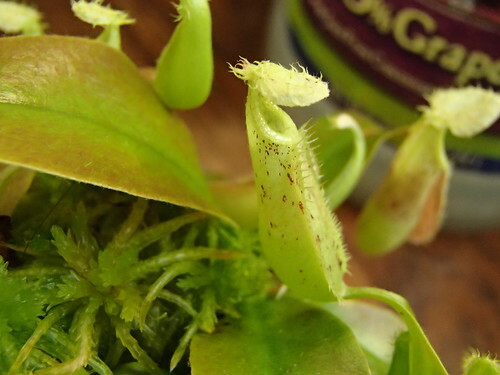 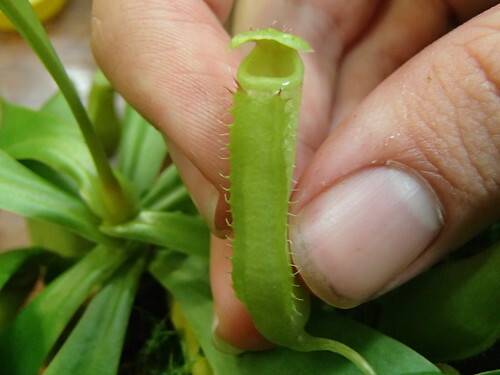 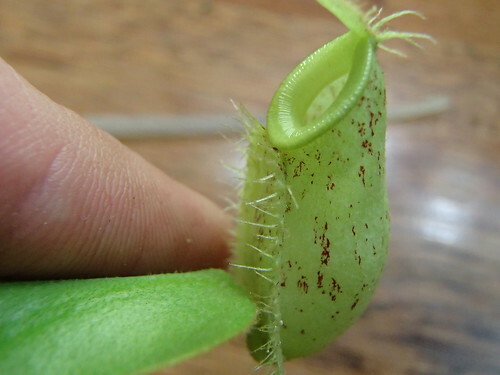 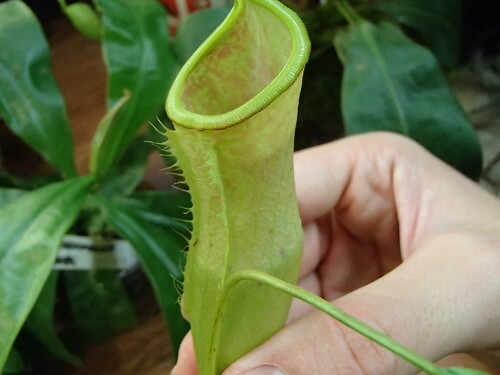 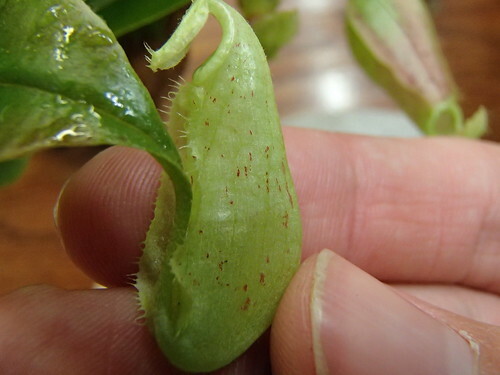 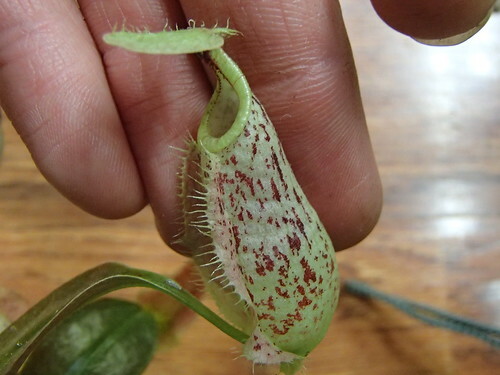 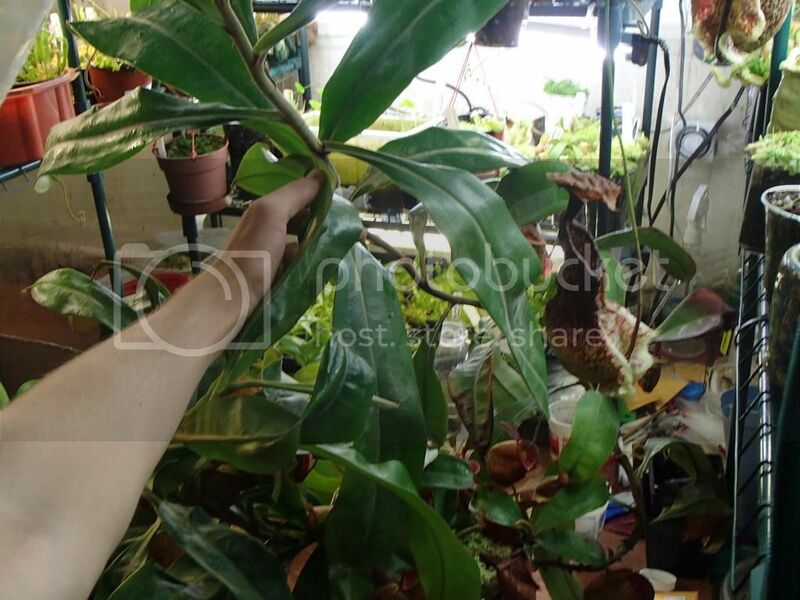 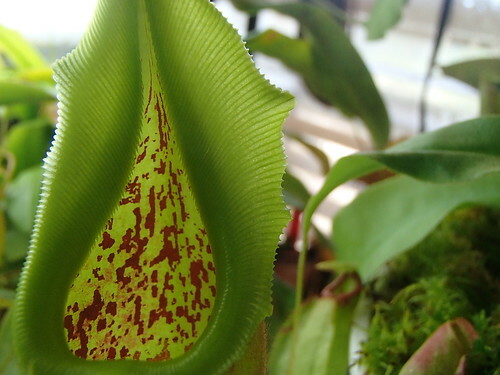 It seems a shared trait of most of these plants is the dark pigment on the inner edge of the peristome. 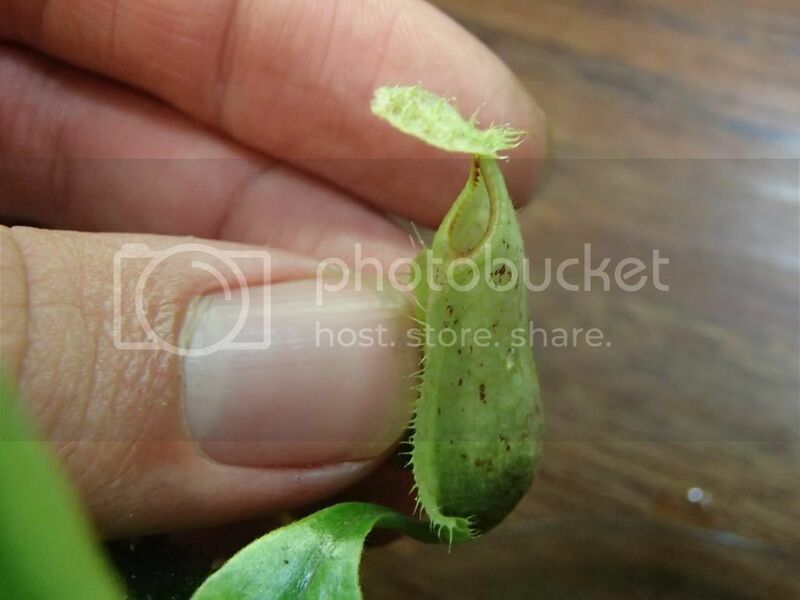 Each pic is a different seedling. 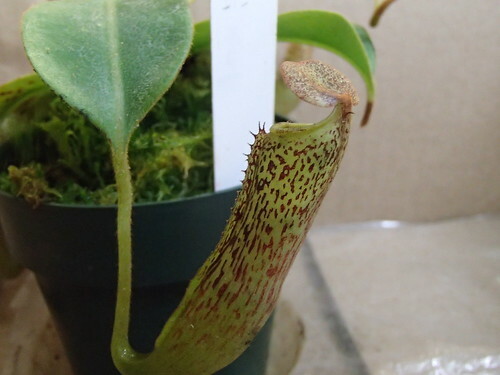 The darkest one, with pink blushing and very deep red spots. 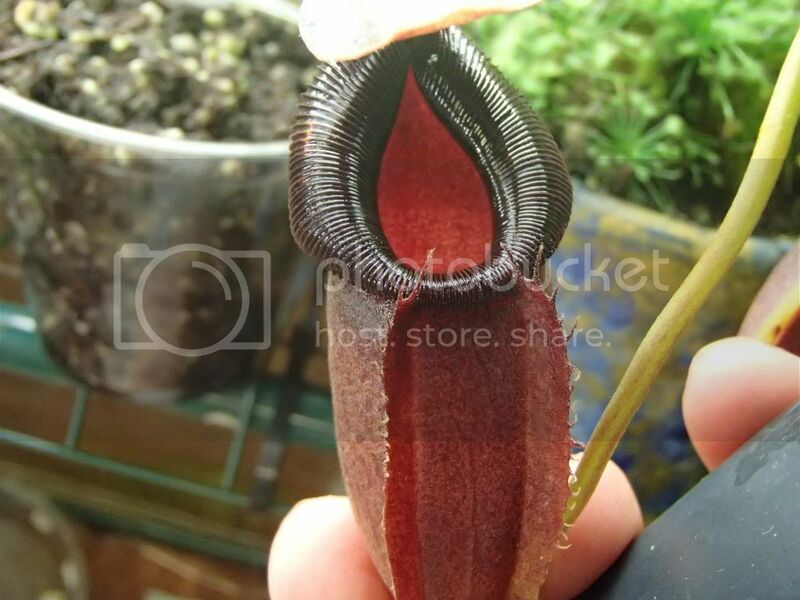 I would bet it turns solid red when adult. 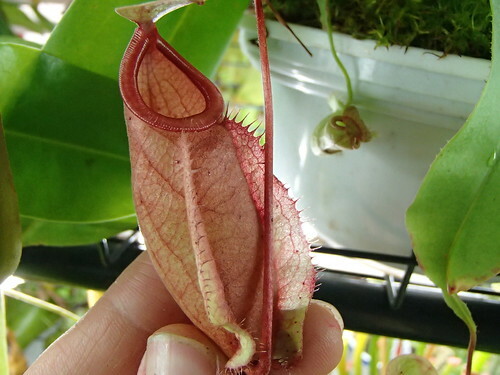 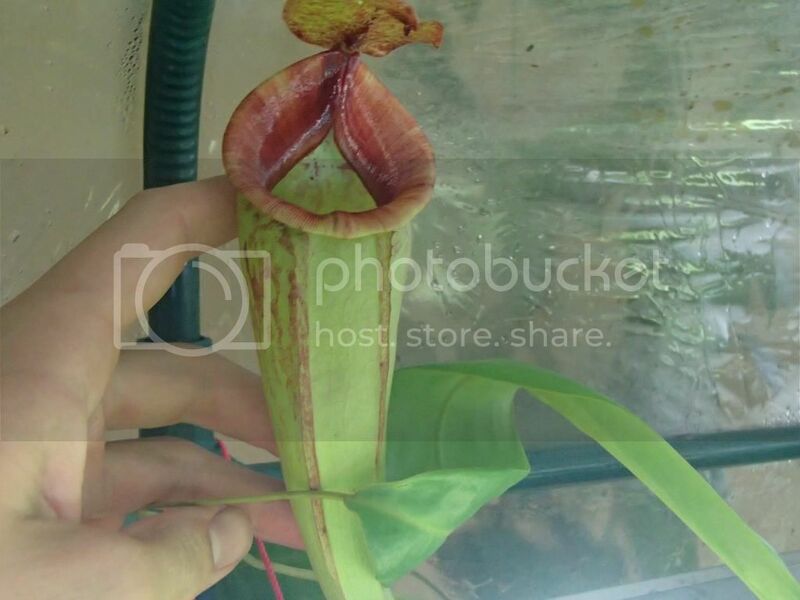 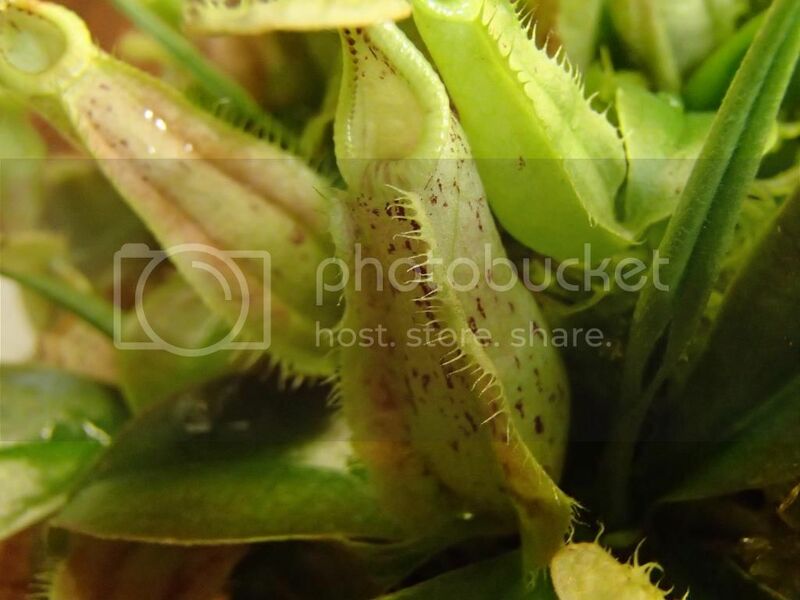 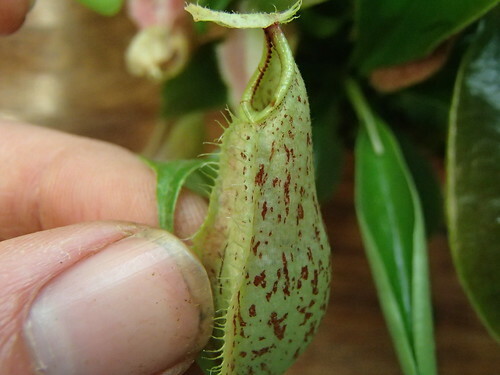 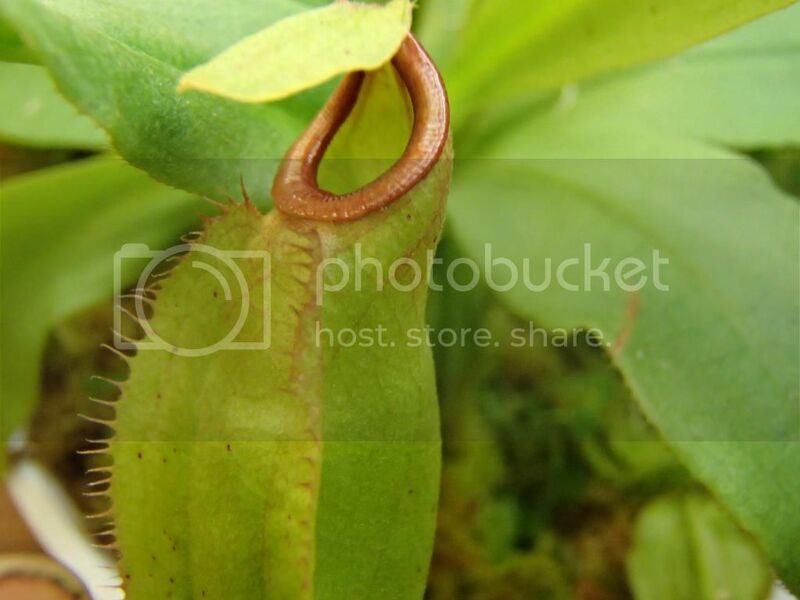 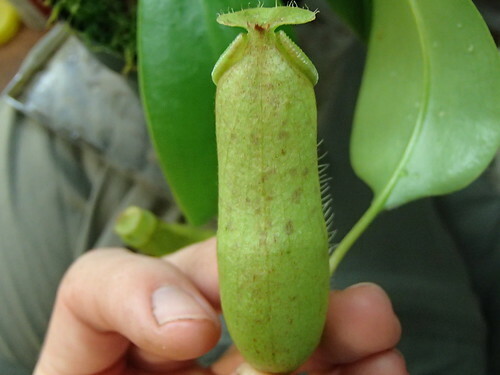 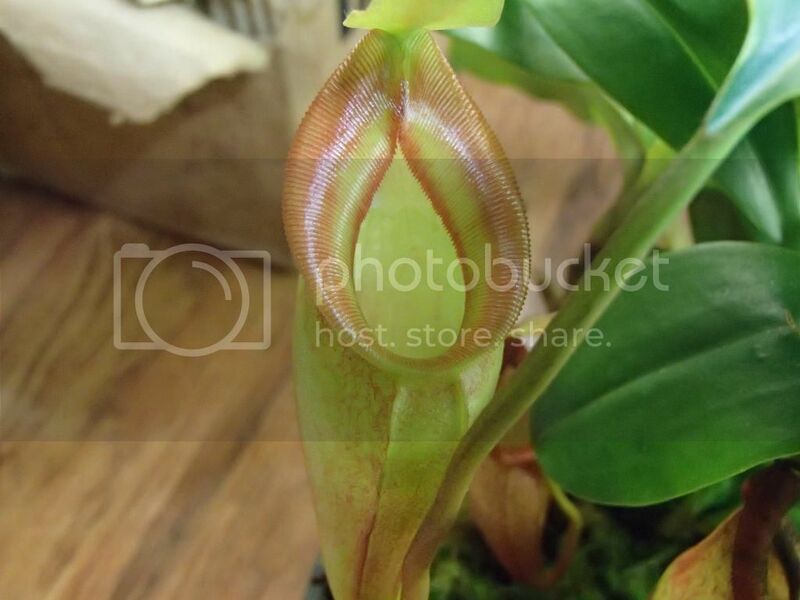 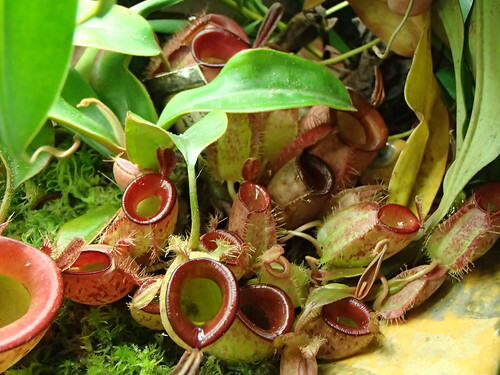 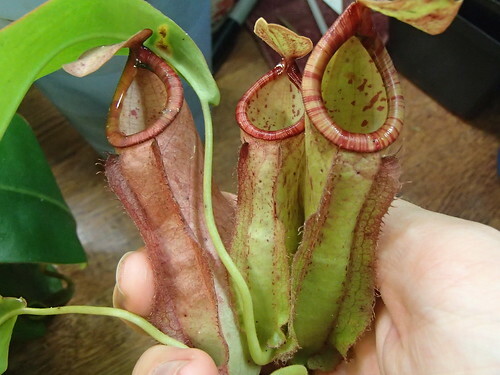 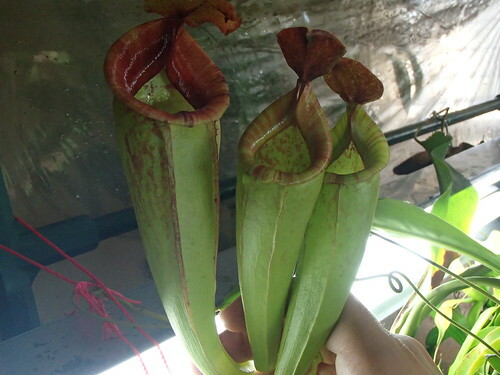 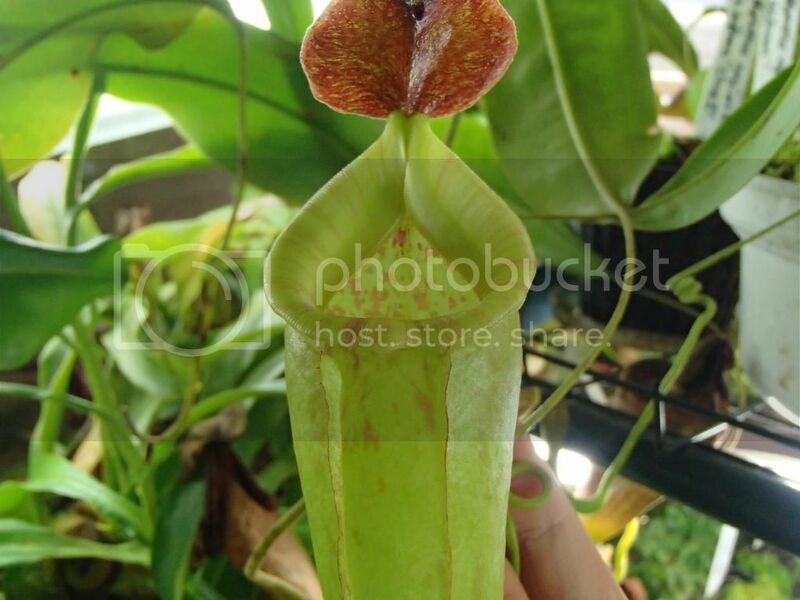 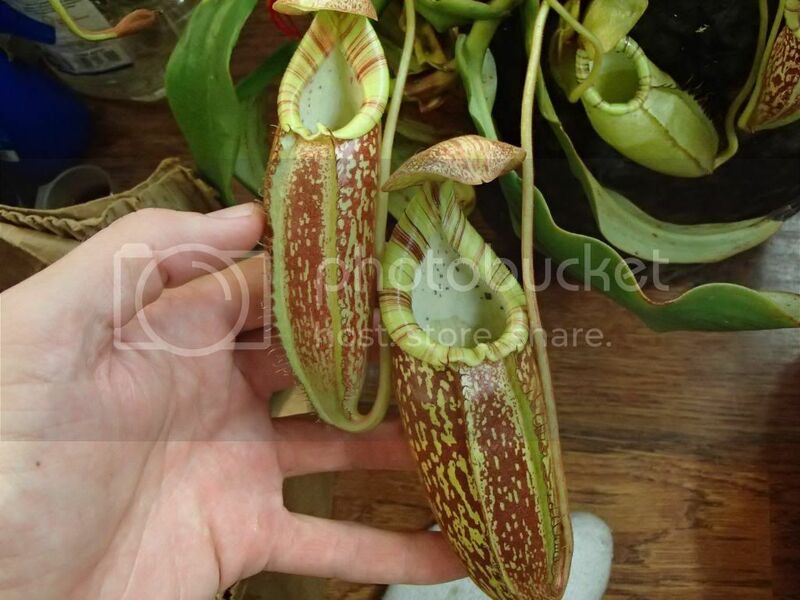 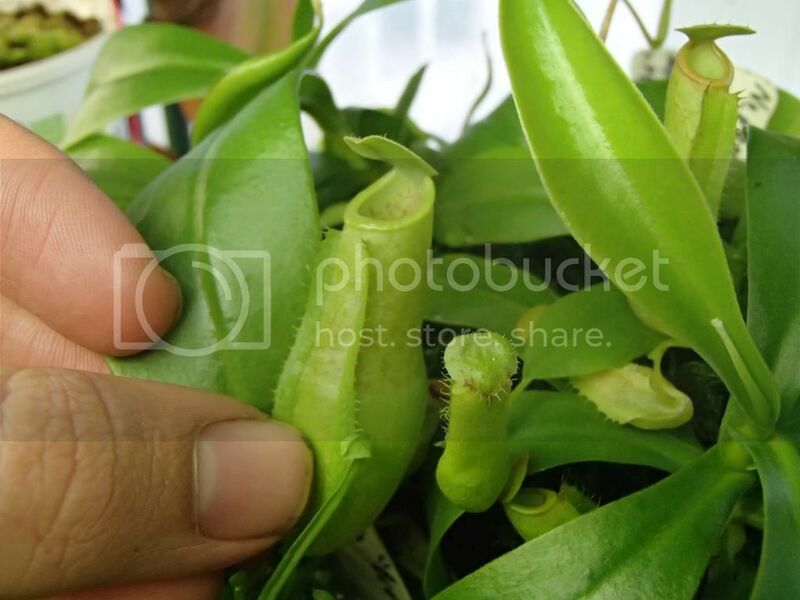 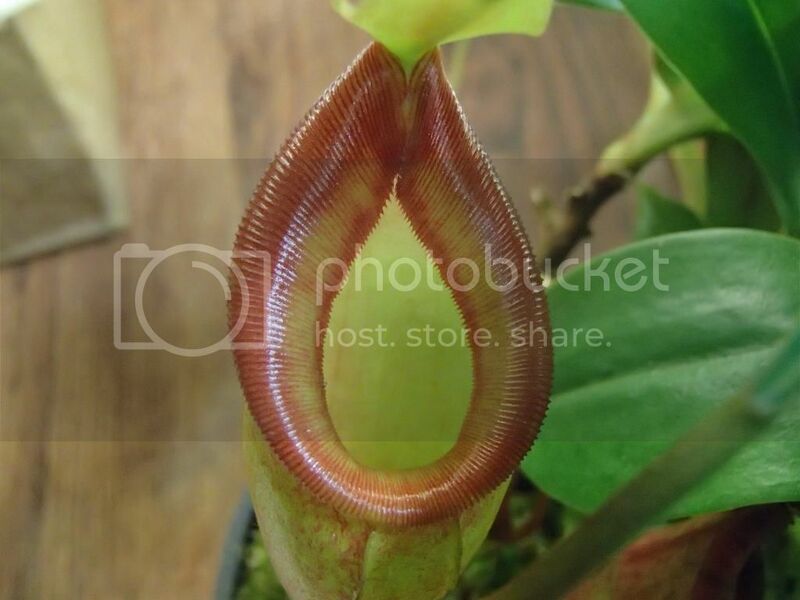 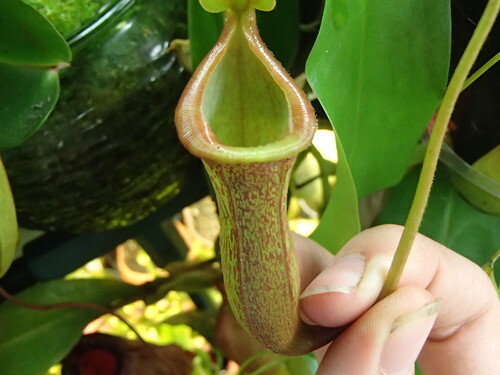 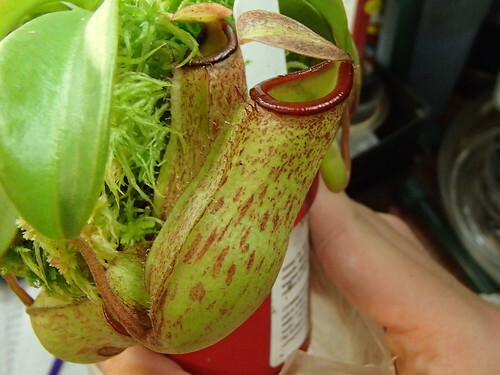 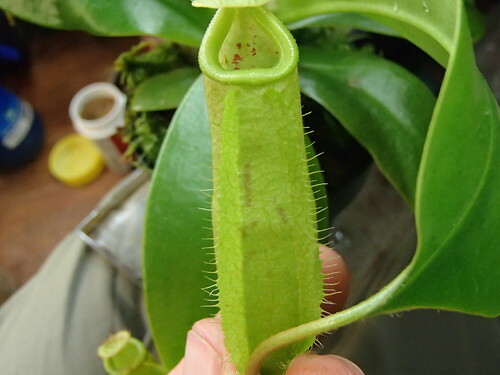 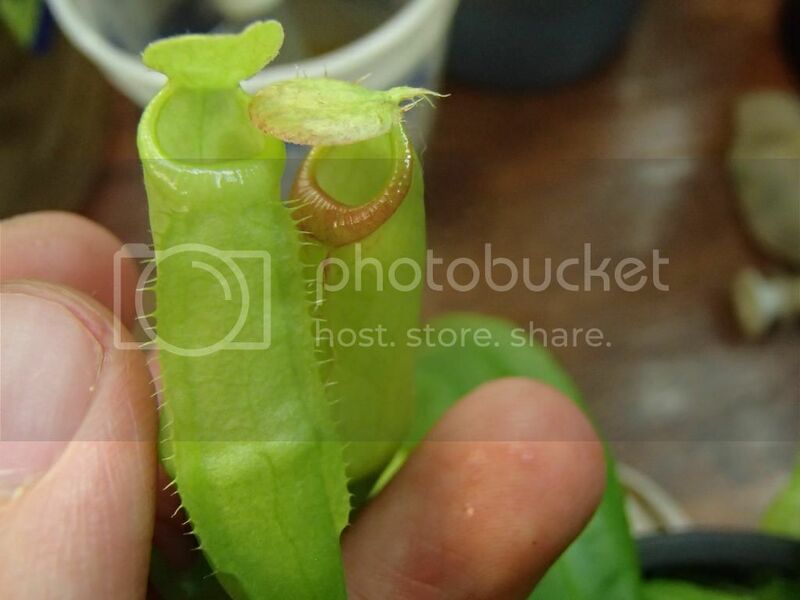 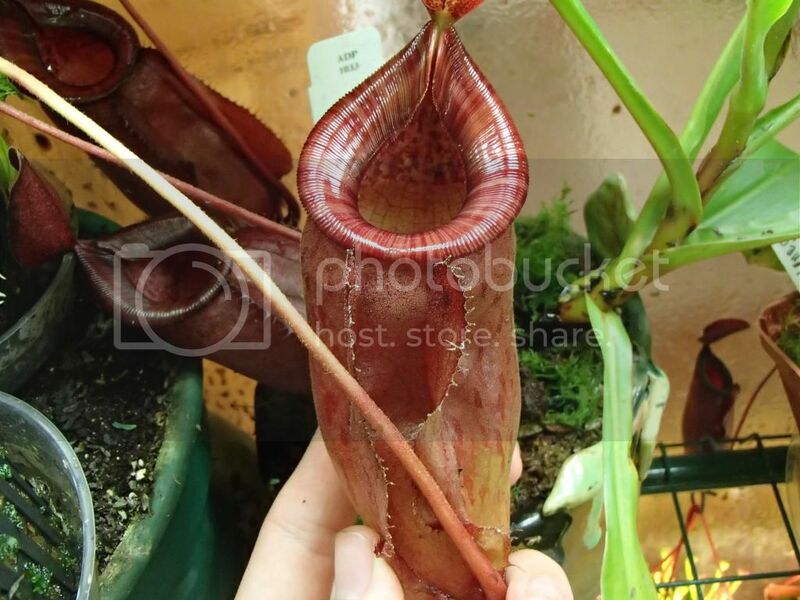 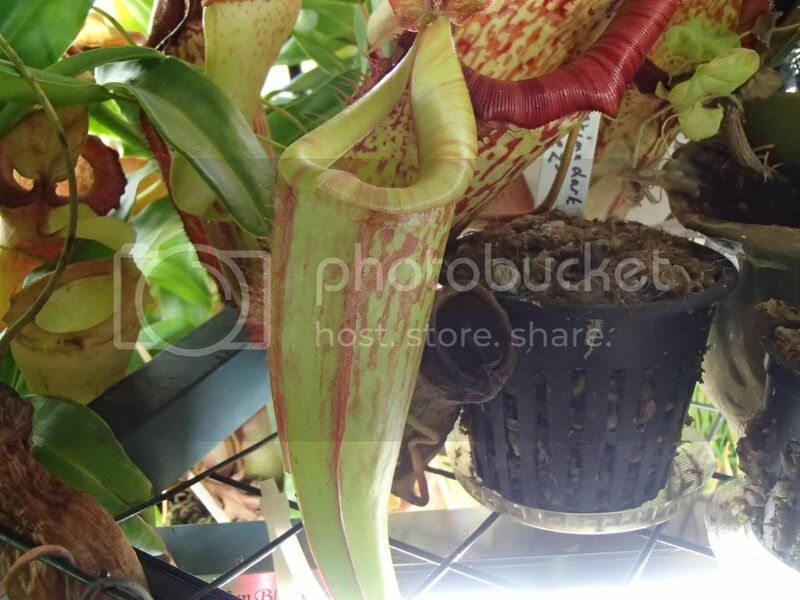 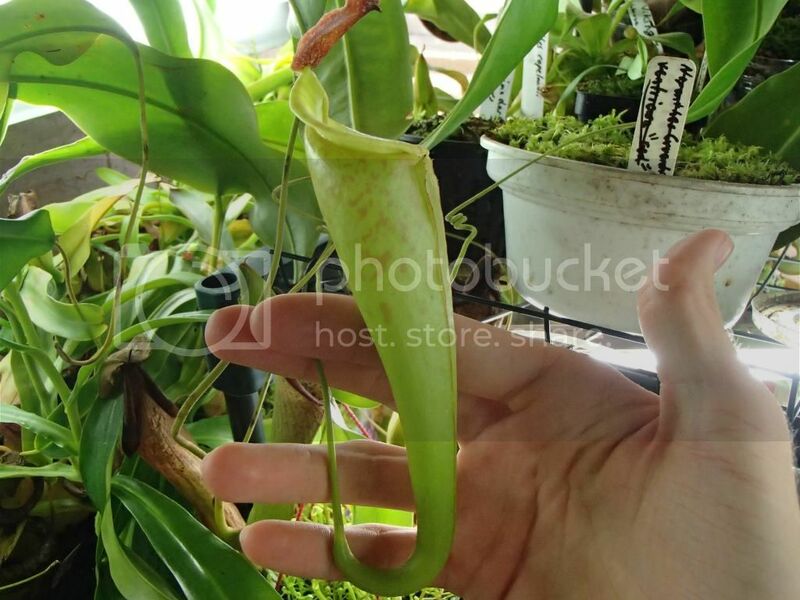 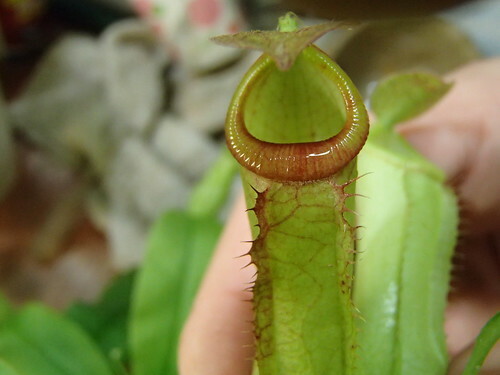 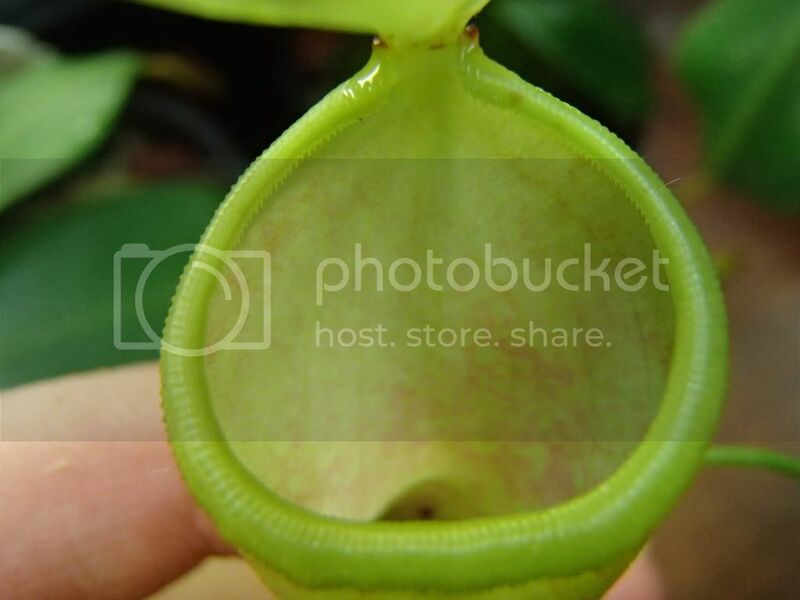 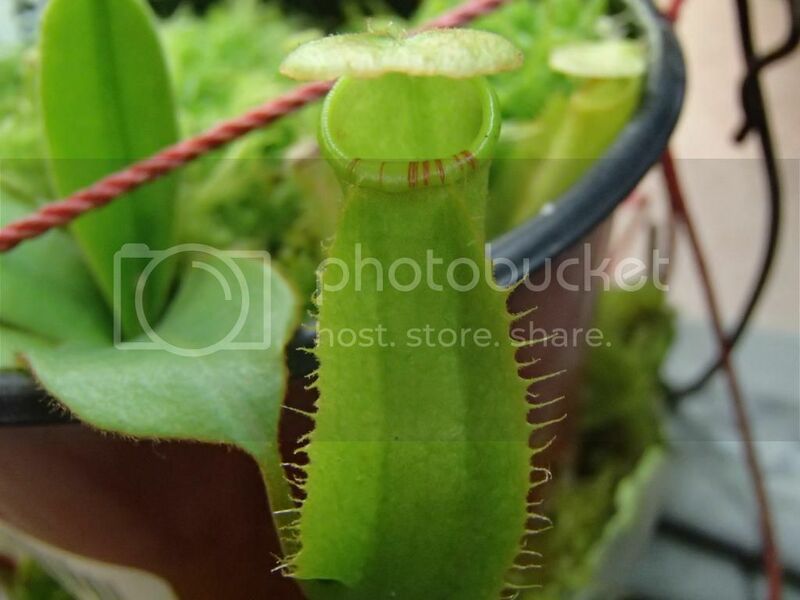 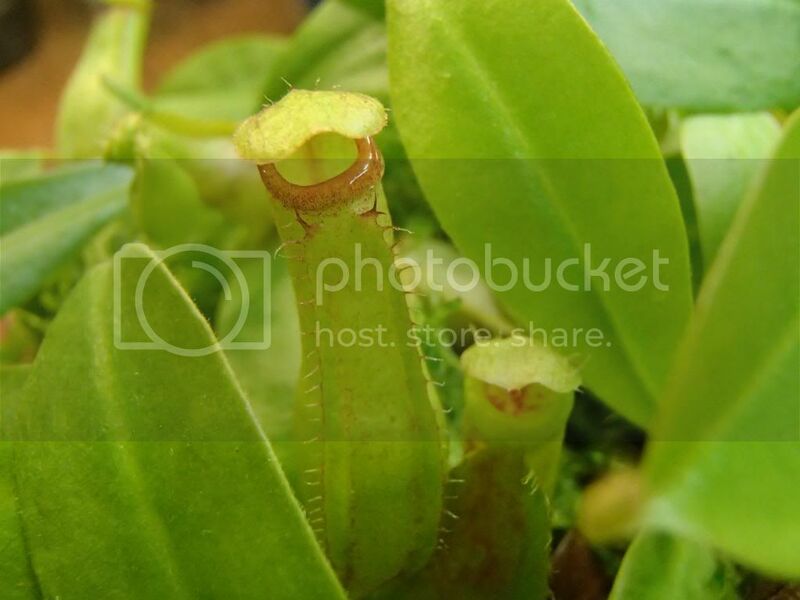 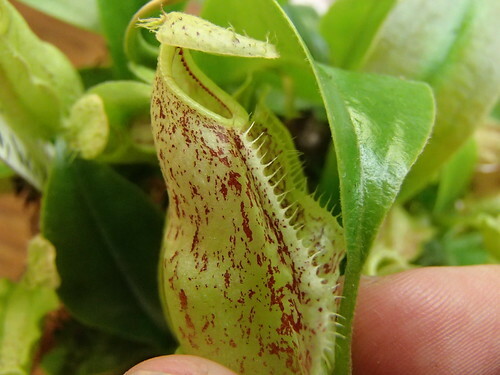 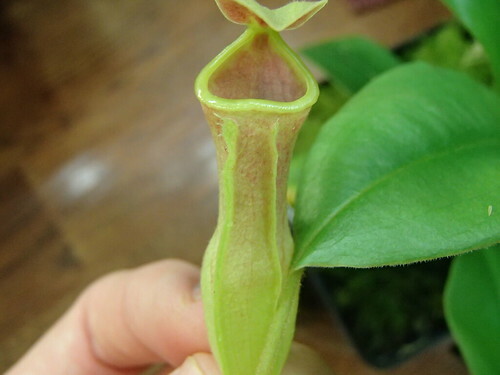 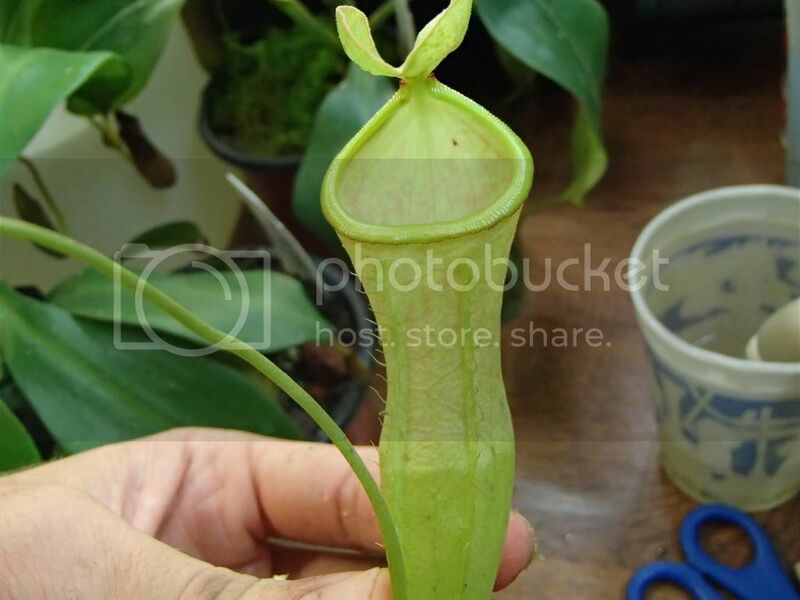 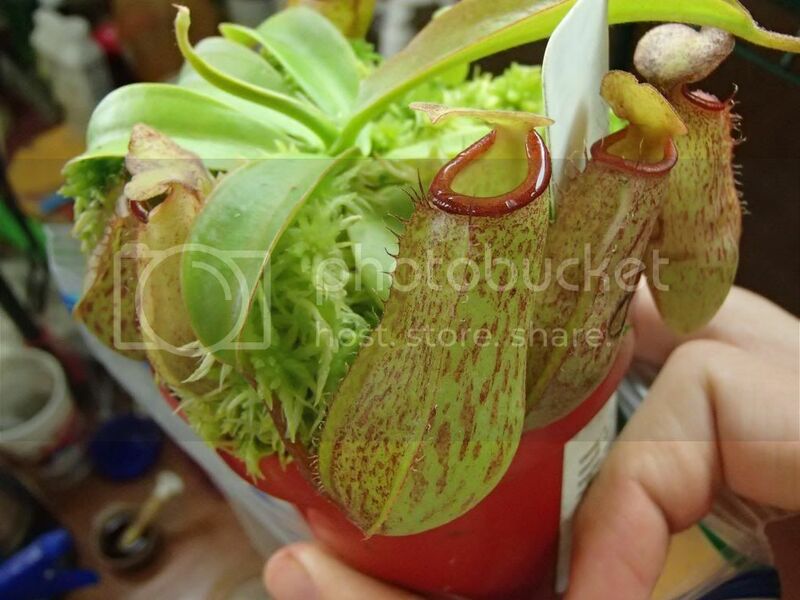 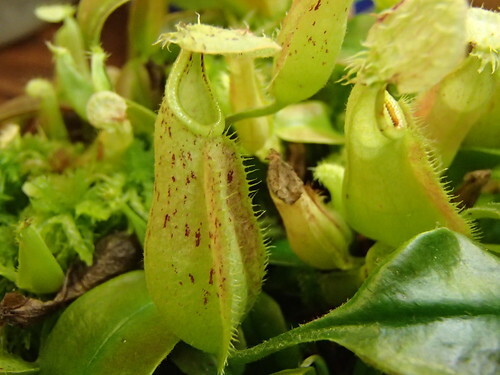 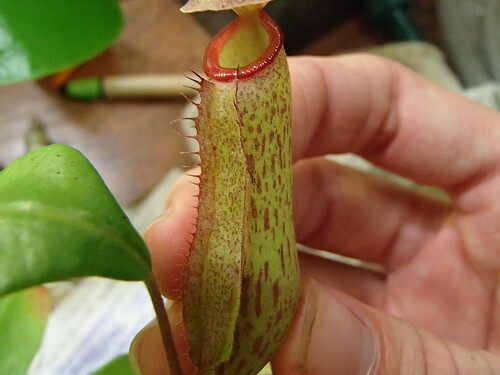 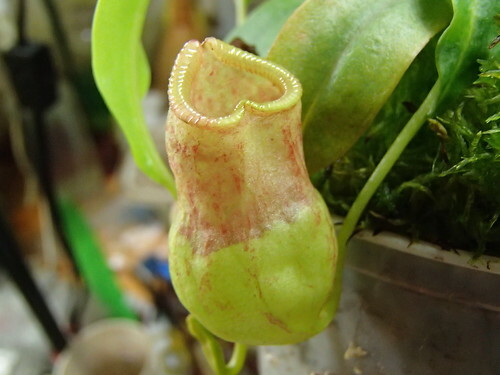 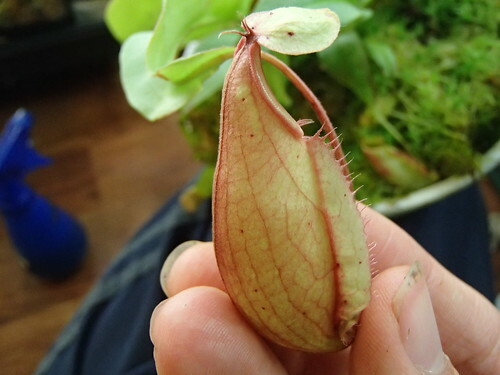 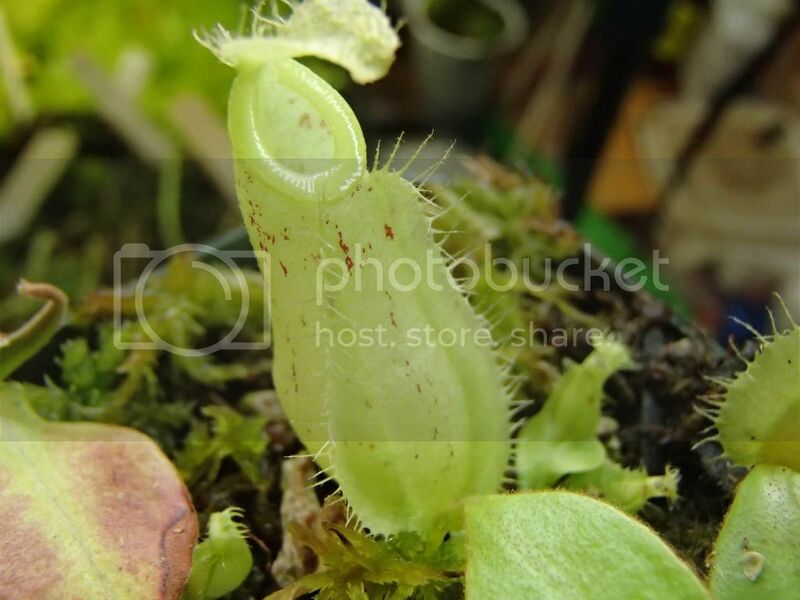 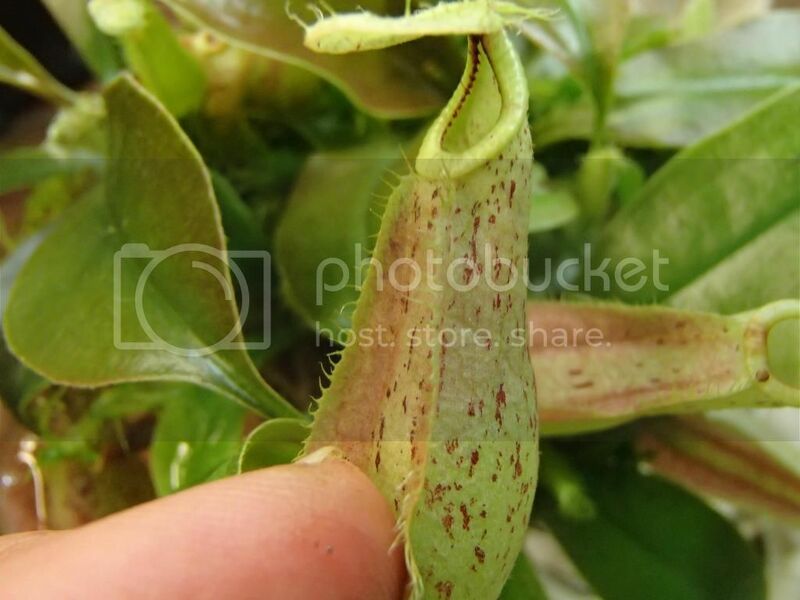 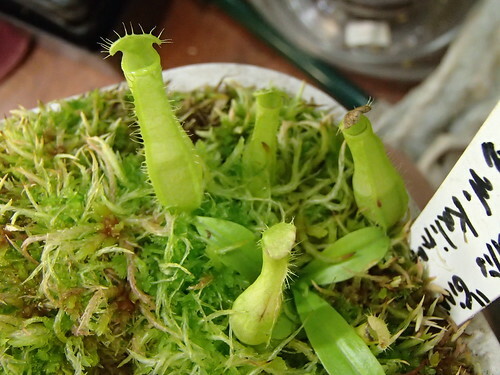 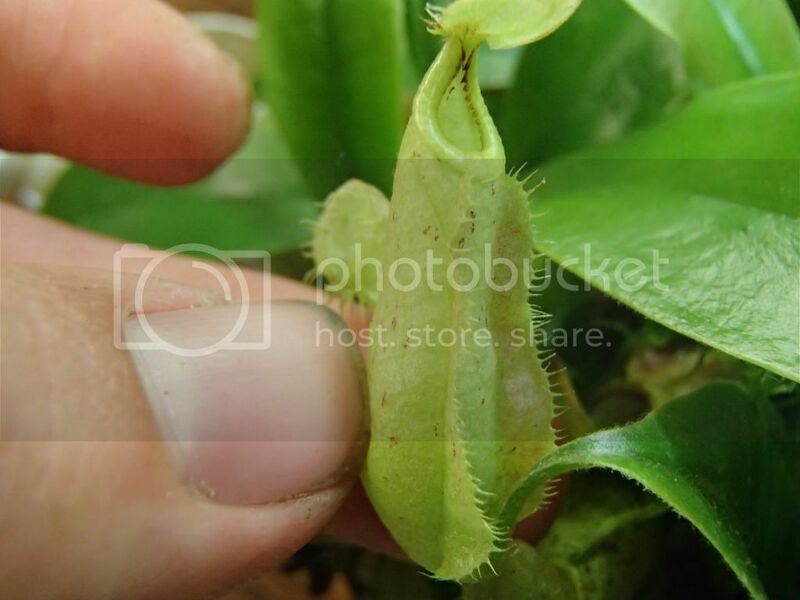 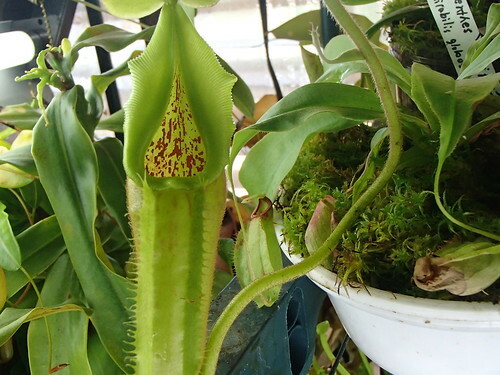 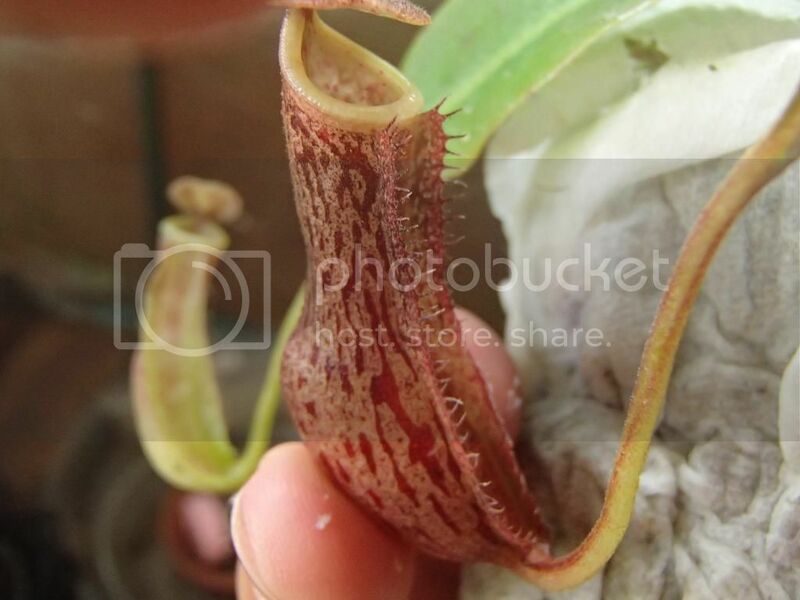 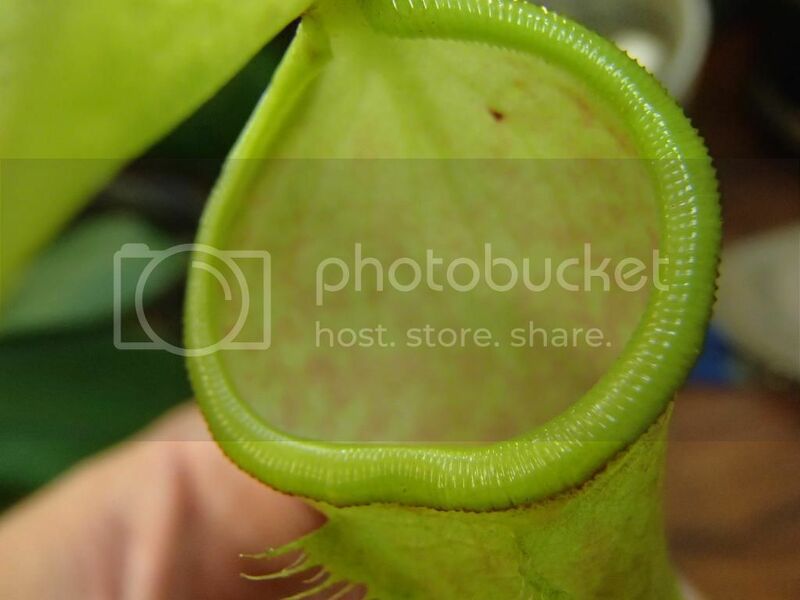 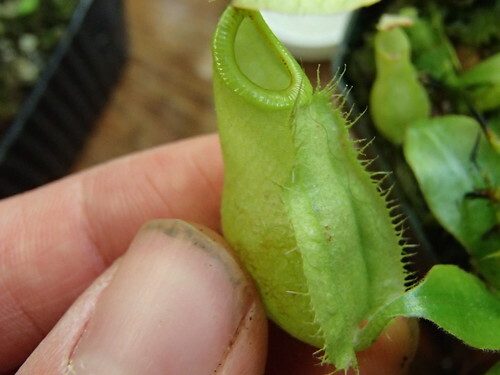 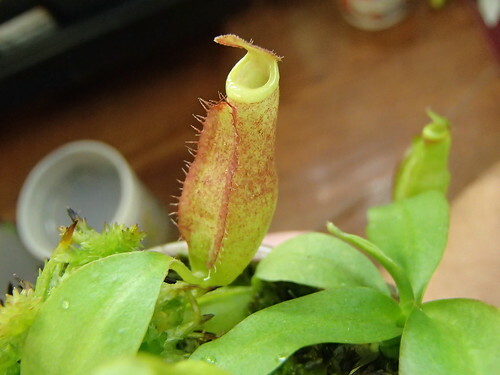 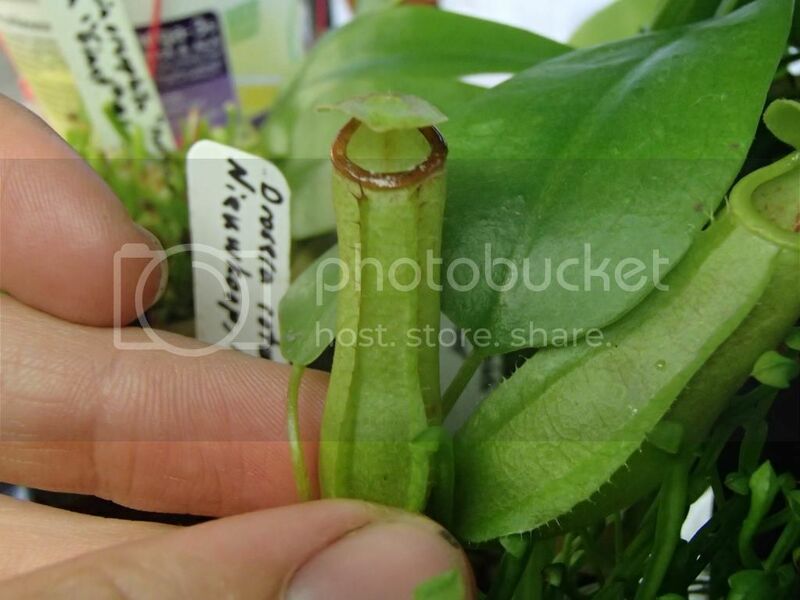 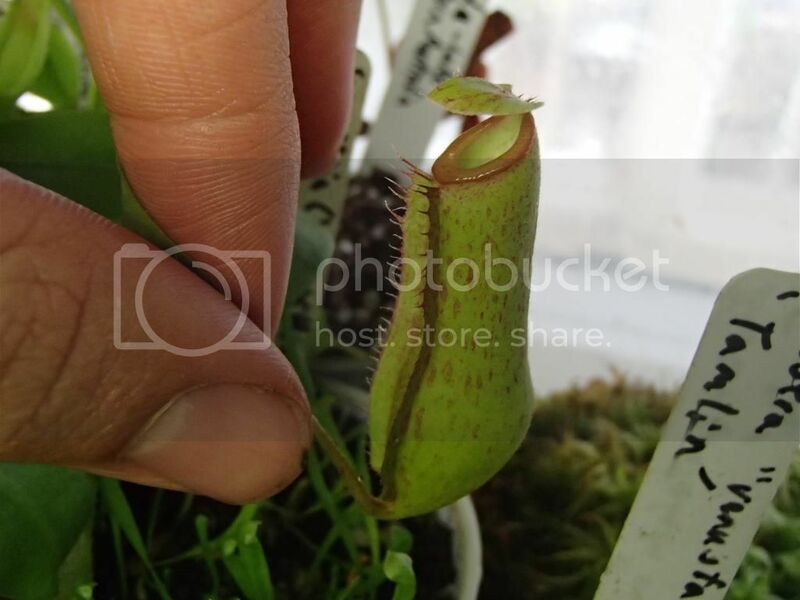 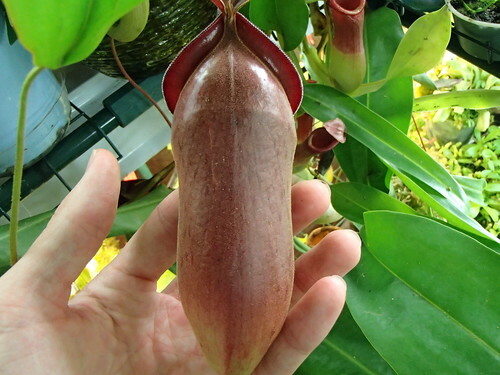 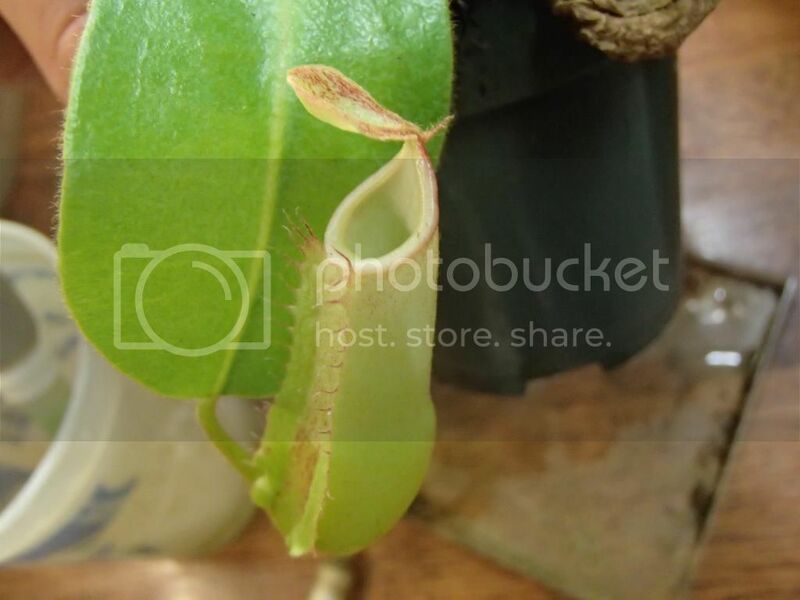 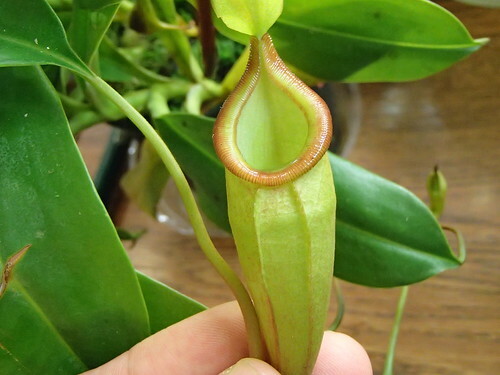 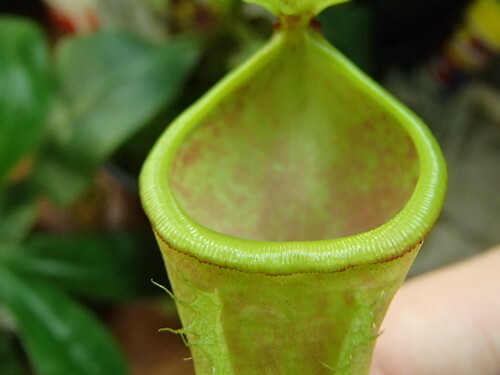 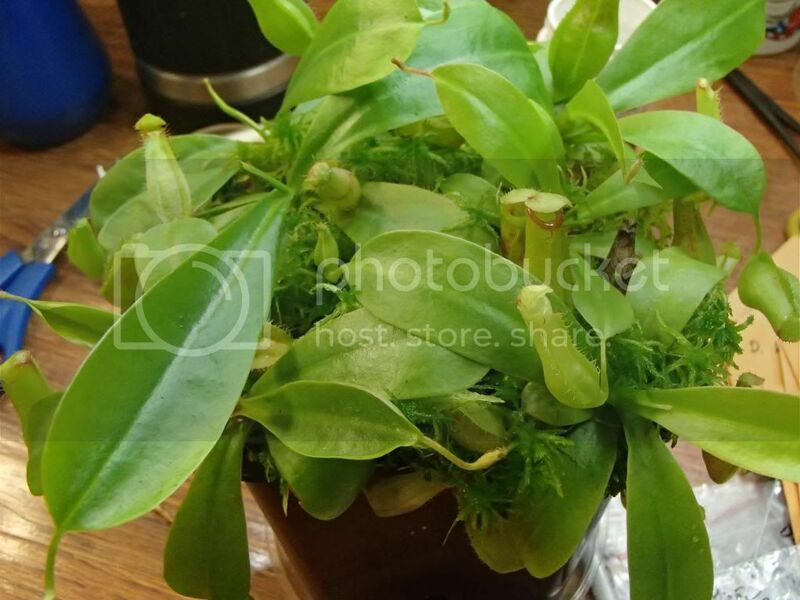 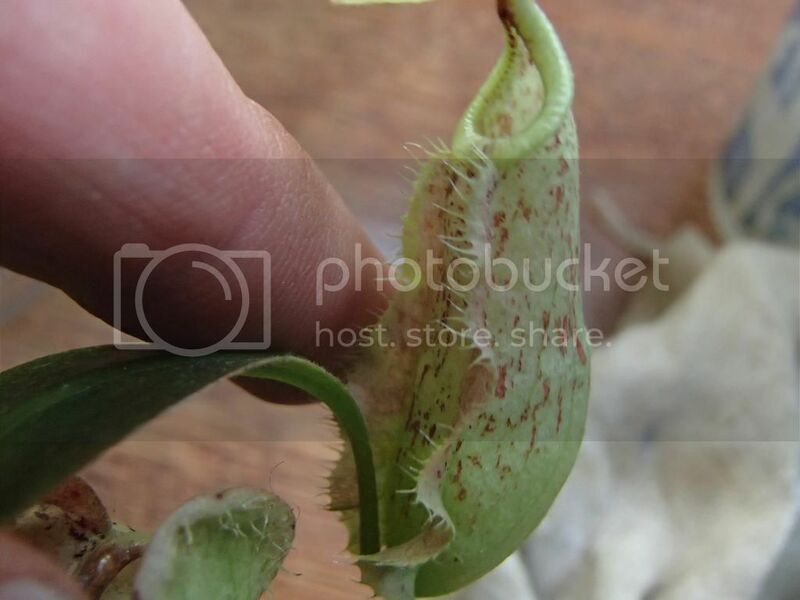 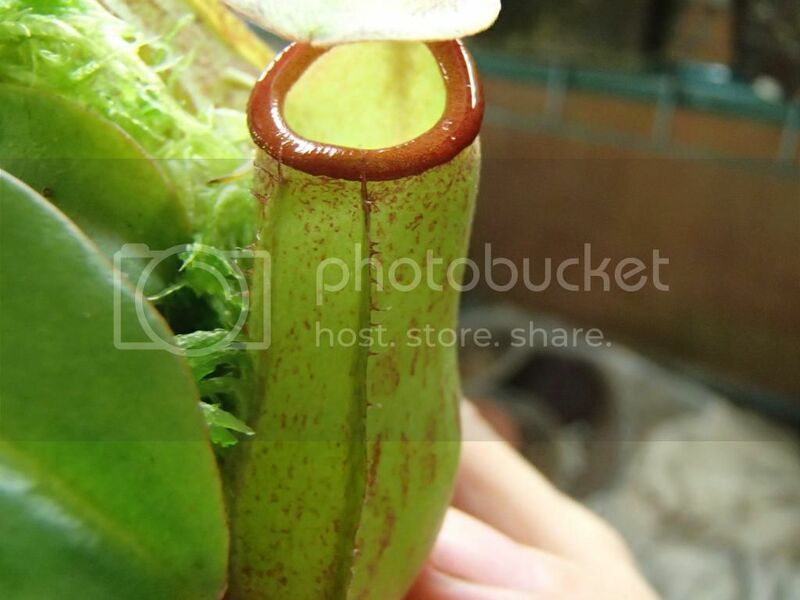 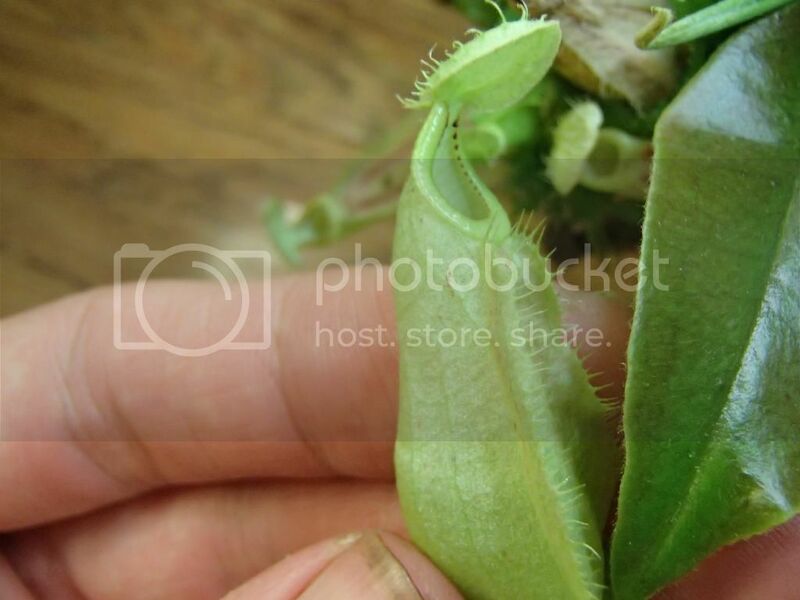 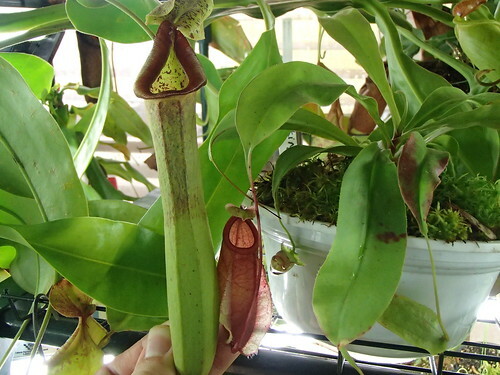 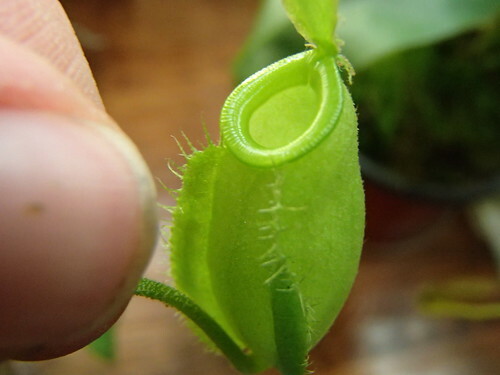 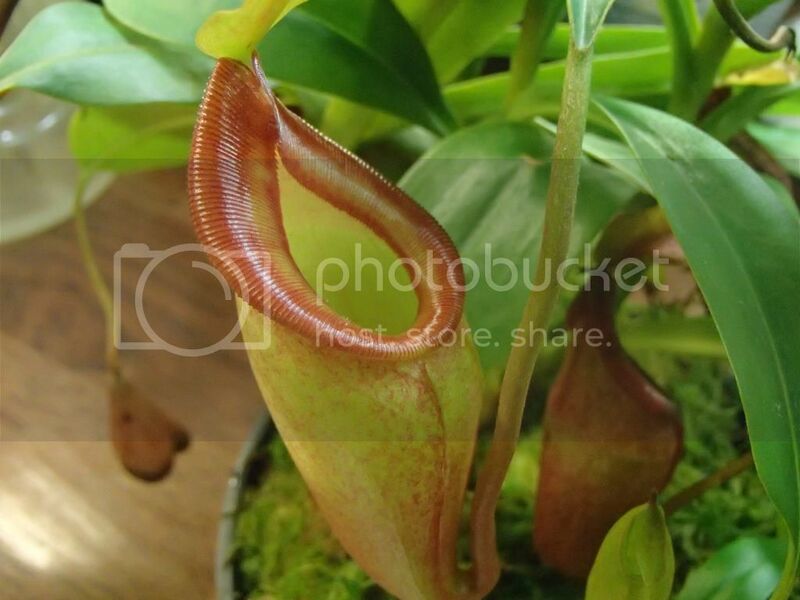 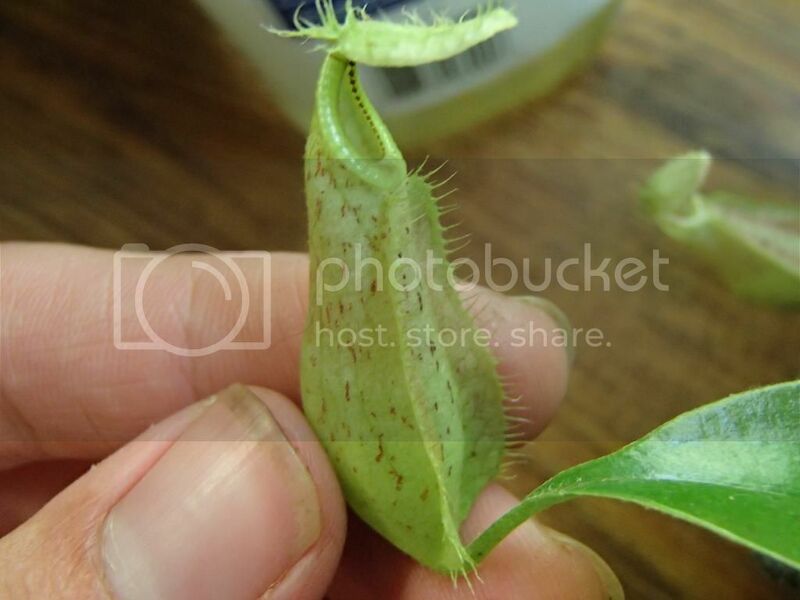 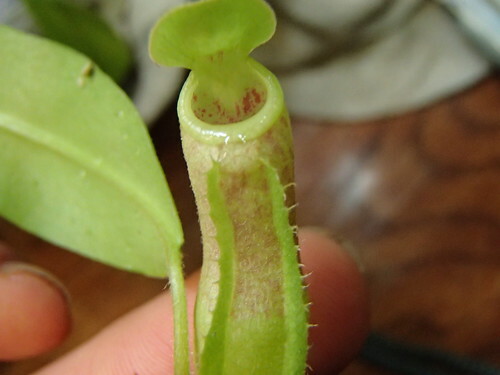 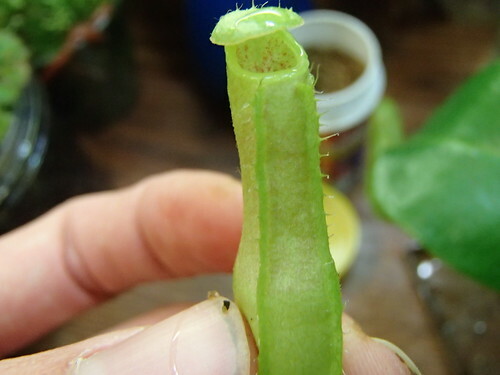 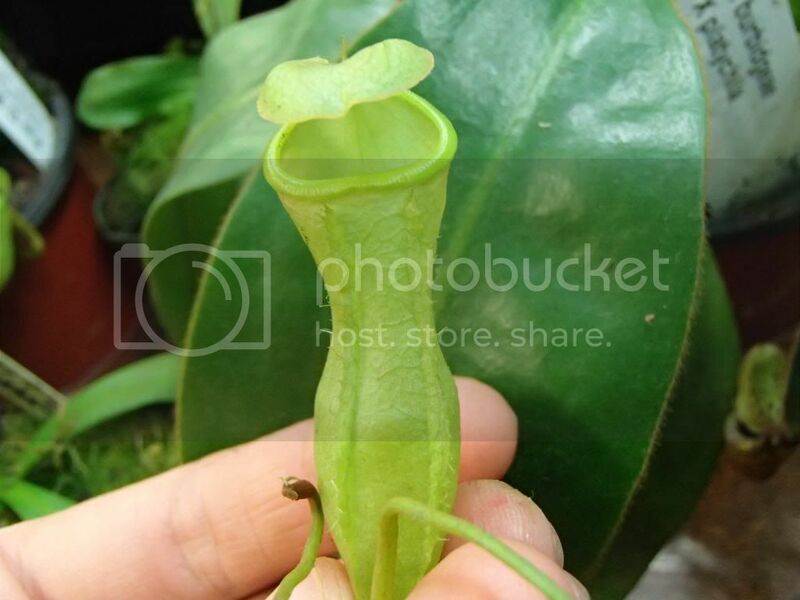 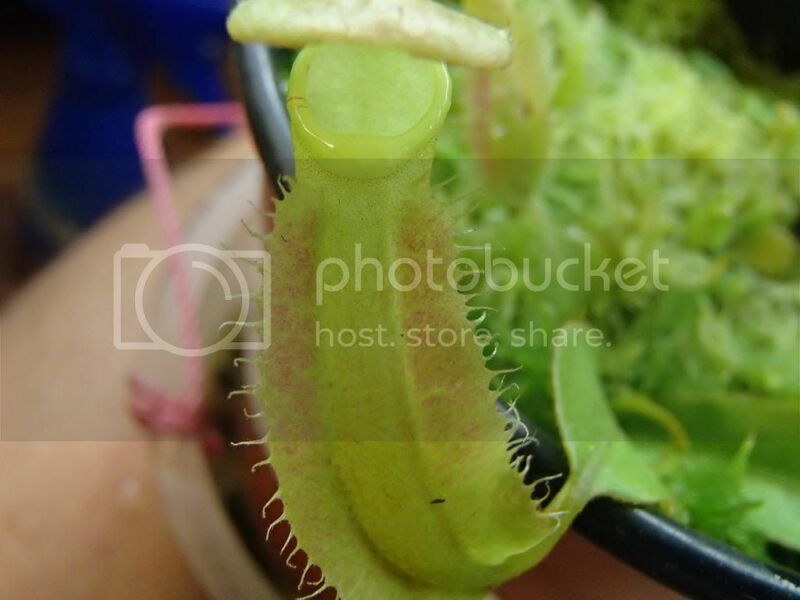 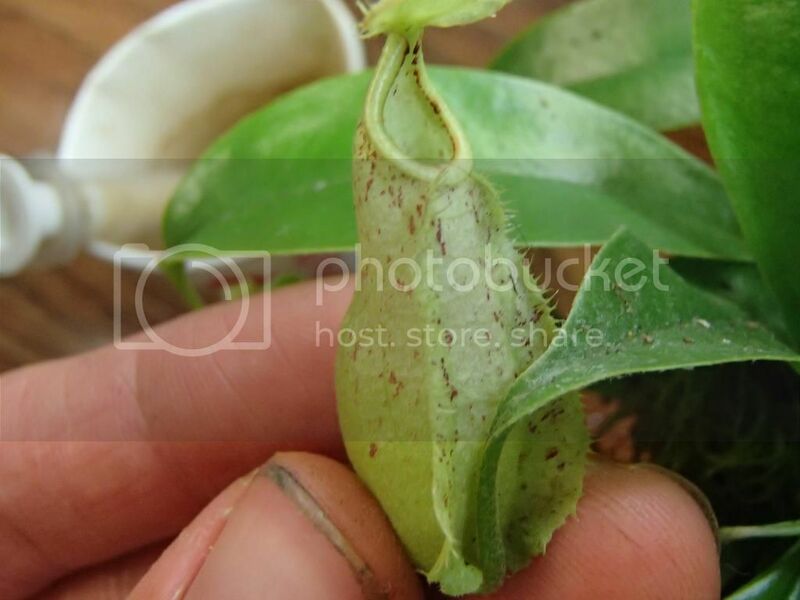 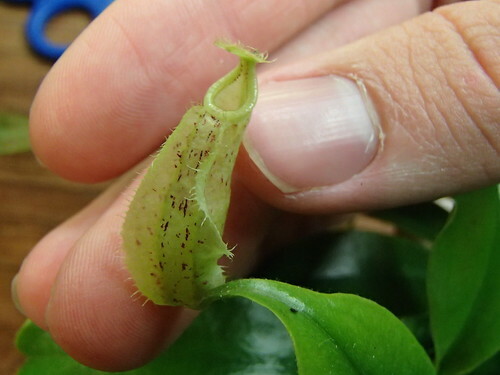 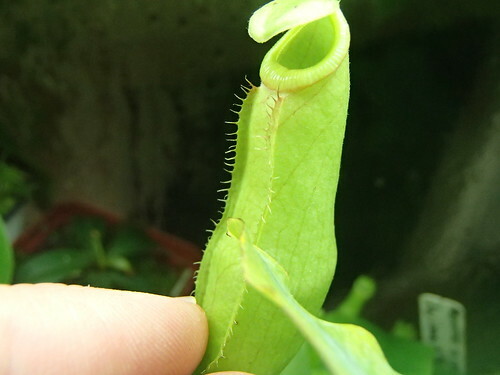 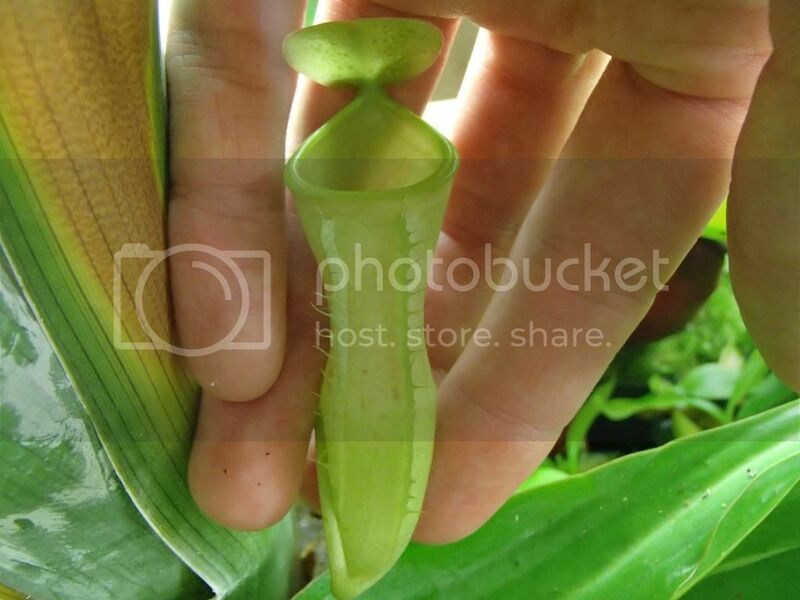 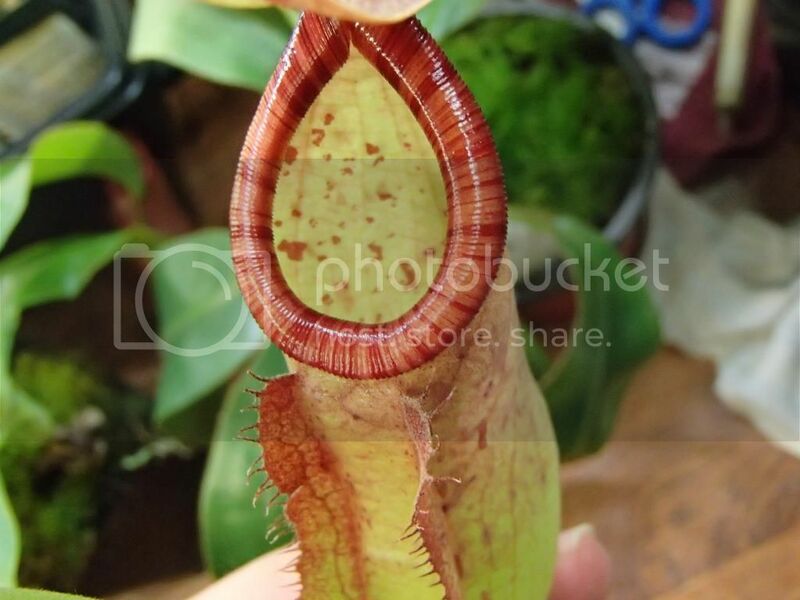 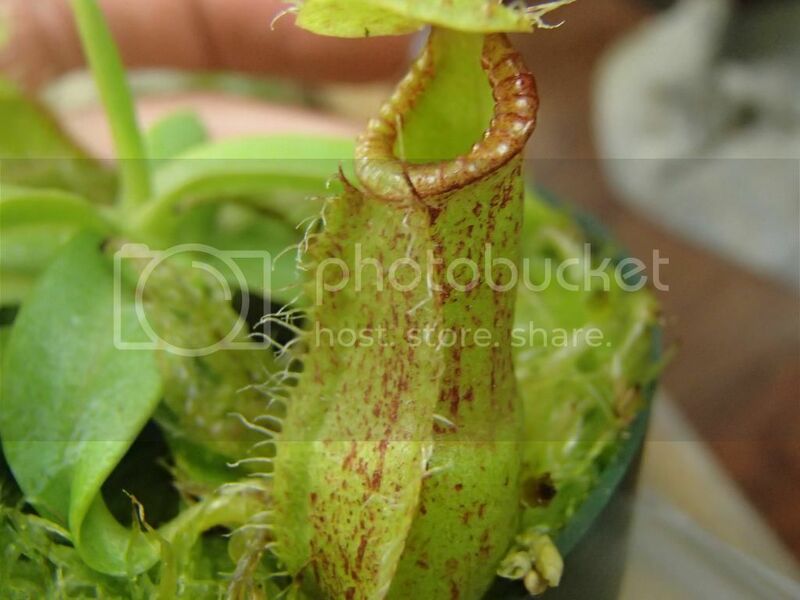 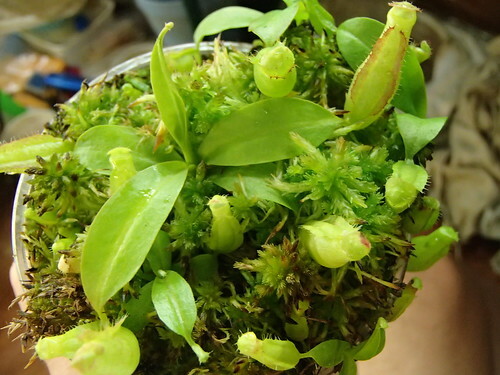 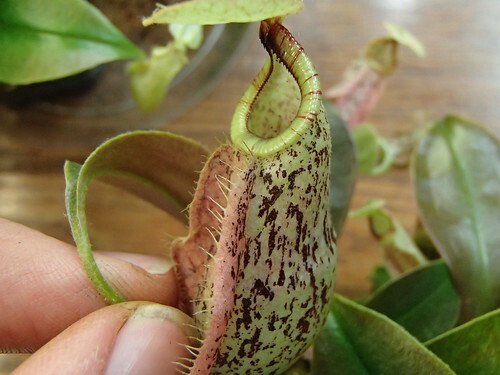 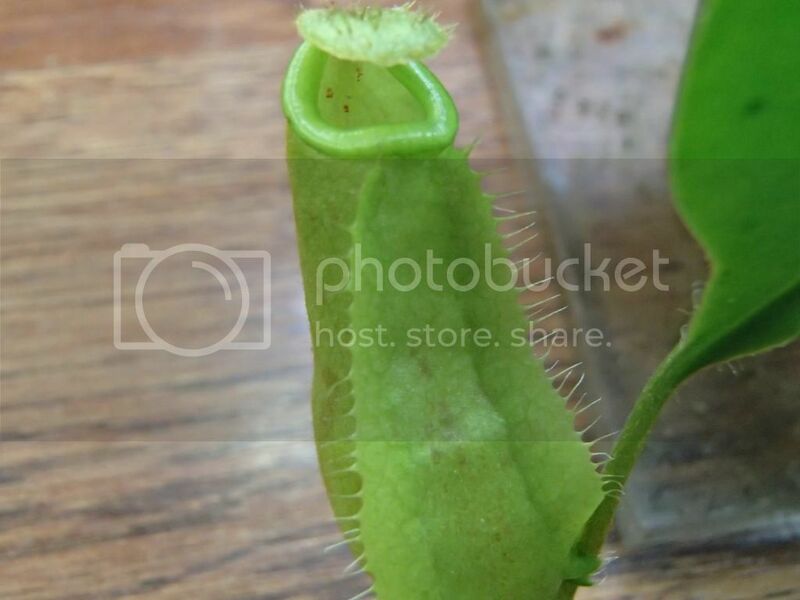 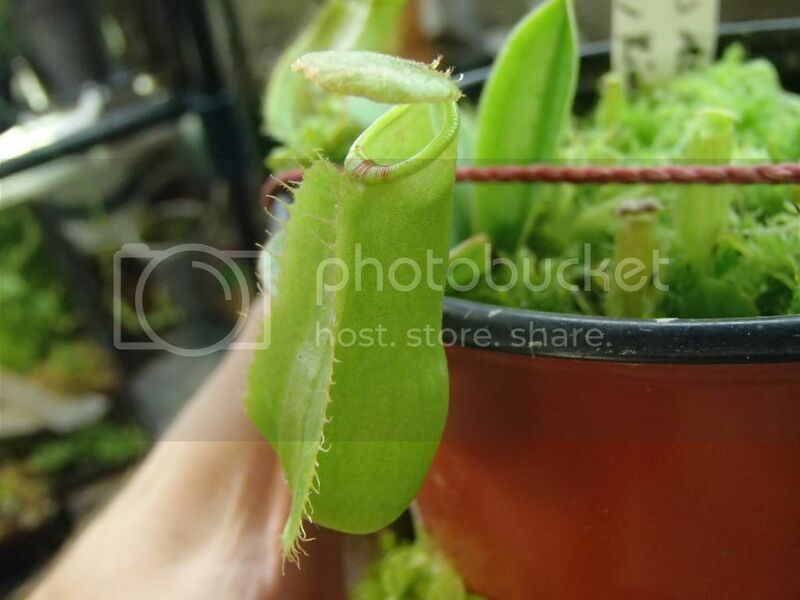 This is the fattest one, the pitchers are nearly globose. 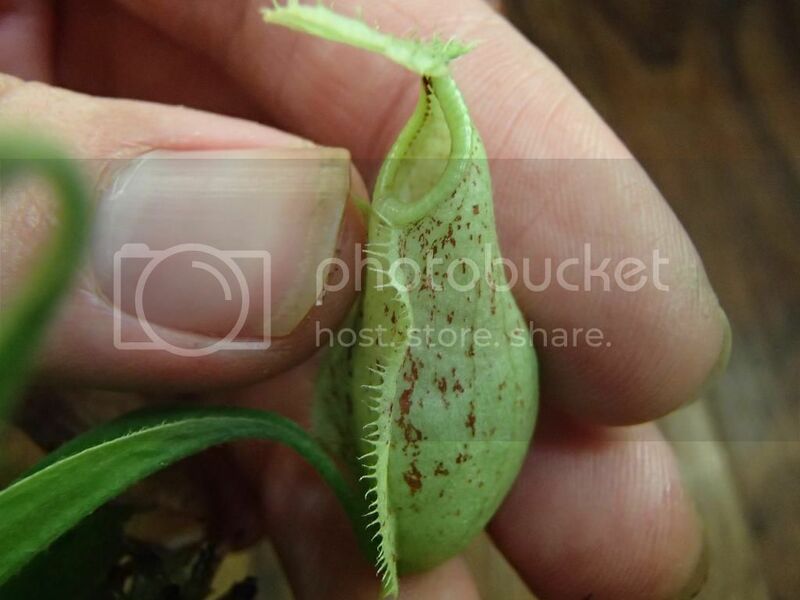 The only sprout out of a batch of x splendiana x tiveyi "red peristome" seeds. 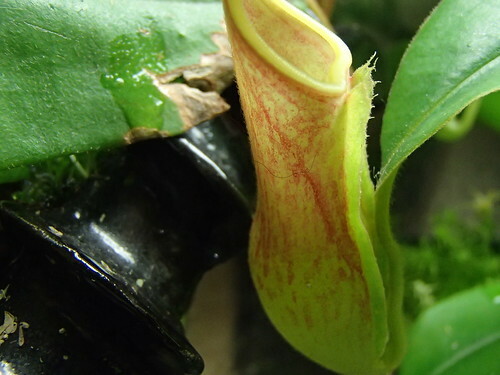 The pitchers are finally showing color, deep pinkish speckling. 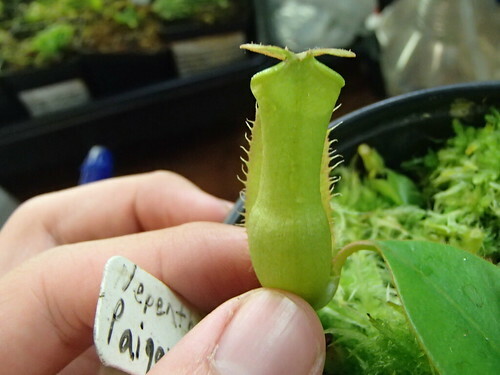 N. 'Rokko' Exotica upper. 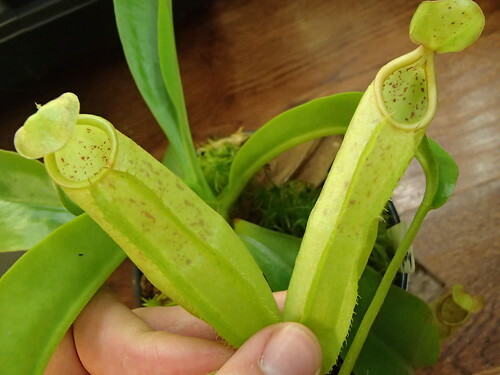 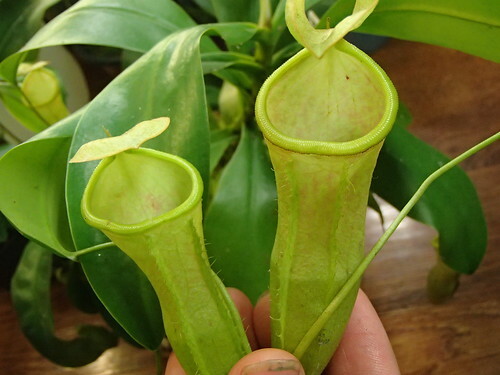 I've had uppers before, but these are the thinnest and most elegant pitchers I've had on any plant, at any time. 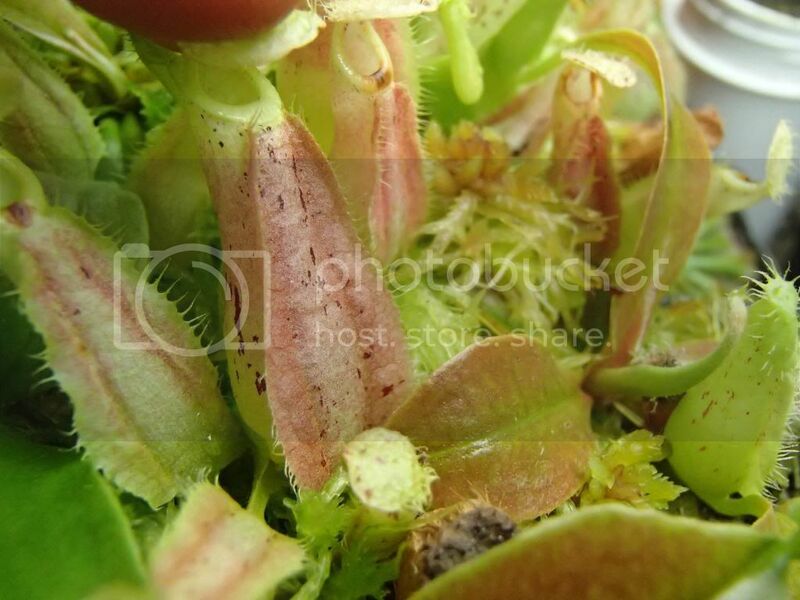 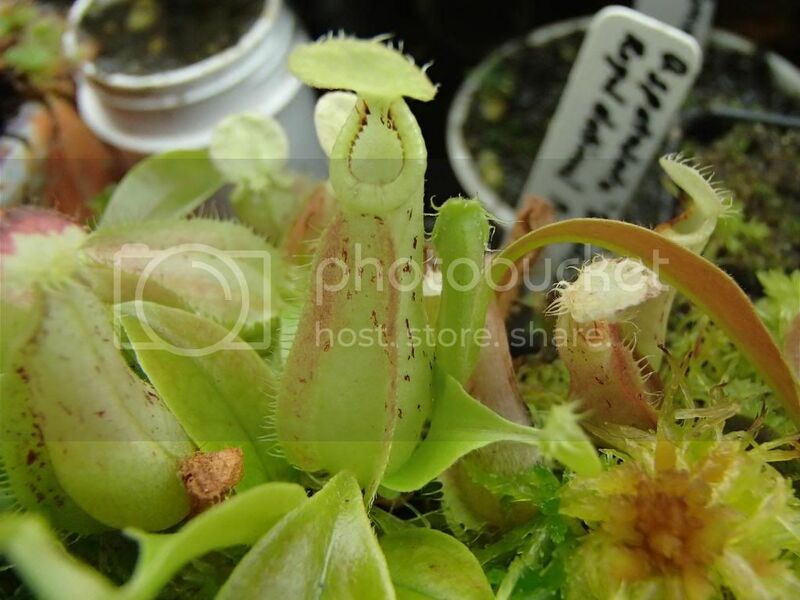 Group shot of pitchers on (inermis x singalana) x mira. 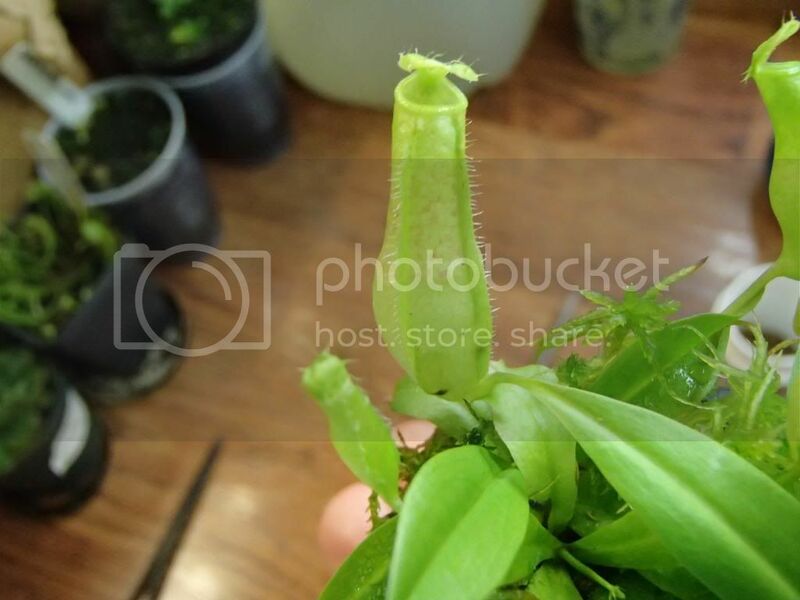 The biggest of the 3 vines has a noticeable swelling at the tip, so fingers crossed that it might be flowering, and as this was an SG plant, maybe female! 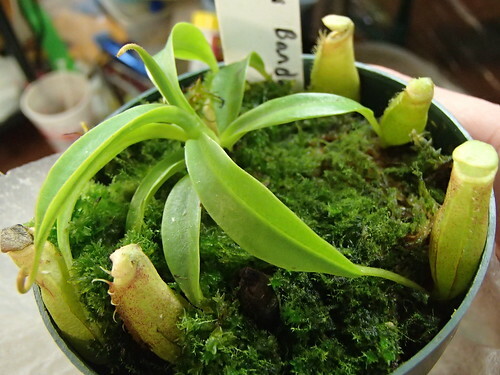 The N. beccariana "red" are making me wonder. 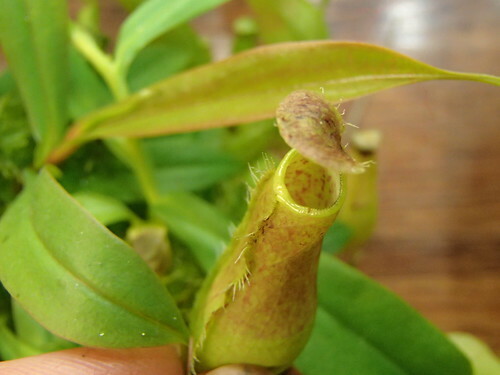 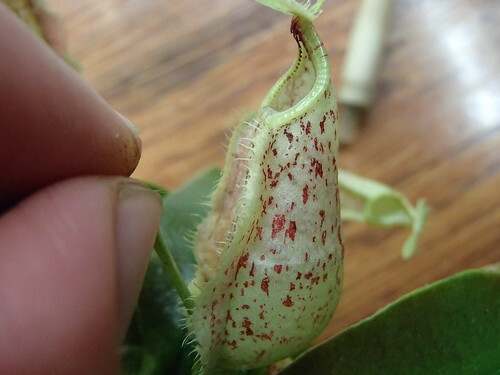 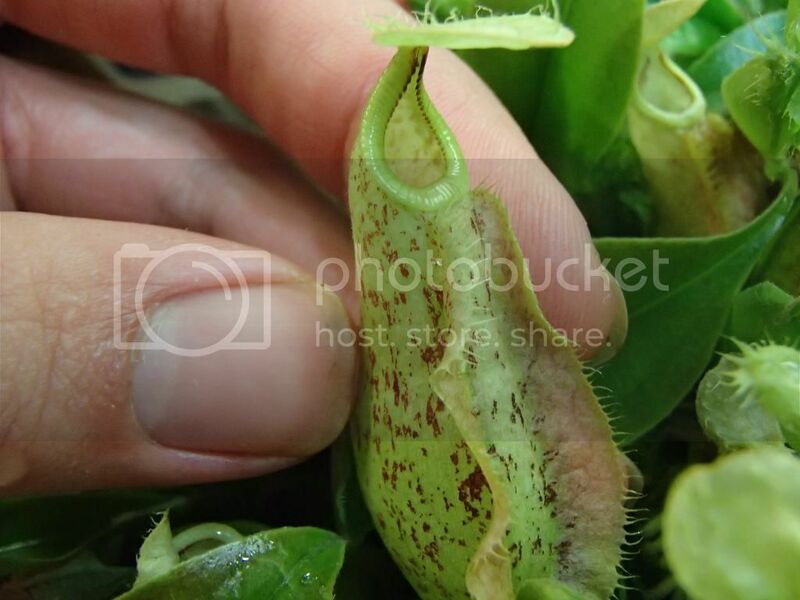 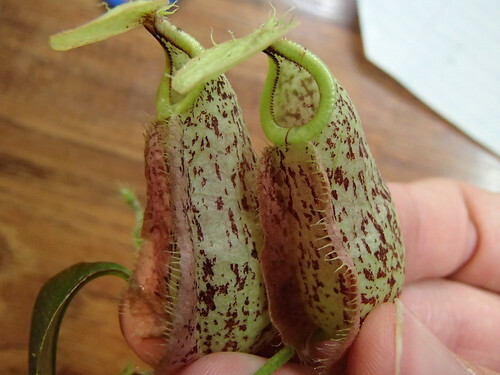 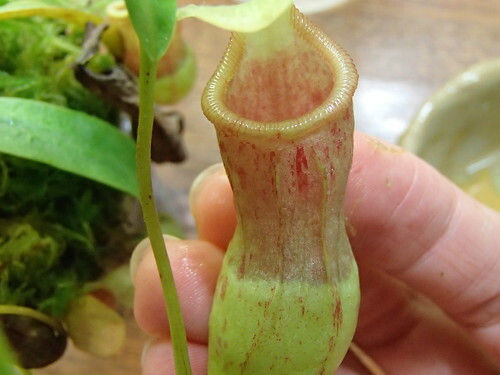 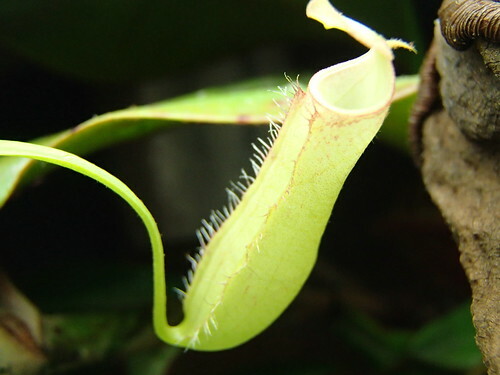 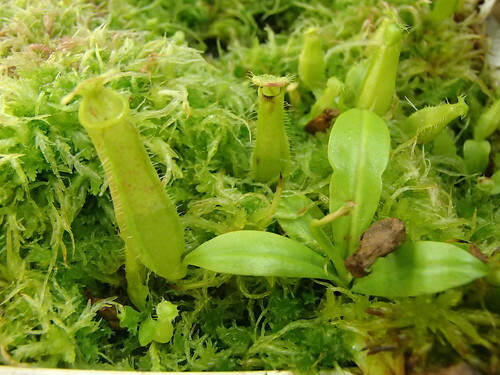 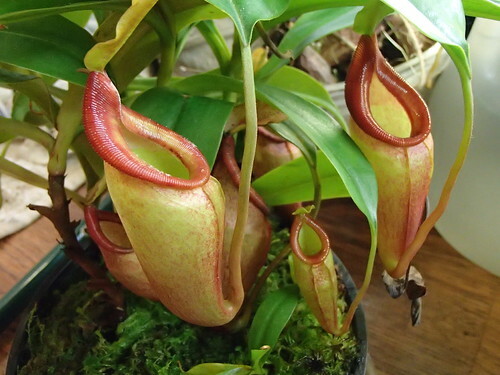 Though young, and the shape may well change, these pitchers have a shape reminiscent from behind of N. eustachya, and the striped lip to boot. 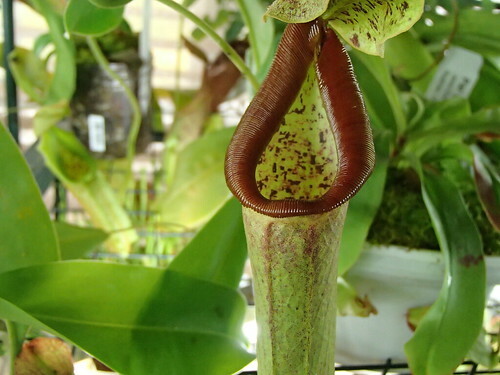 But, they are somewhat closely related, so it may only be ontogenetic superficial. 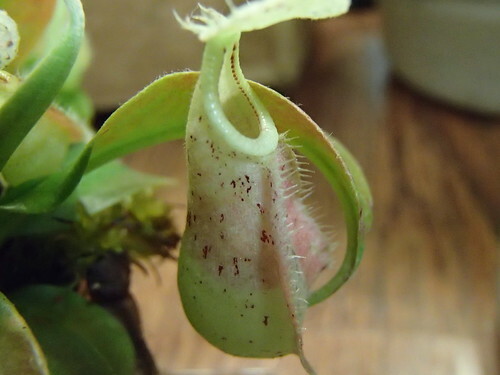 Some exciting recent developments: I have N. (inermis x singalana) x mira flowering, and it is probably going to be male. 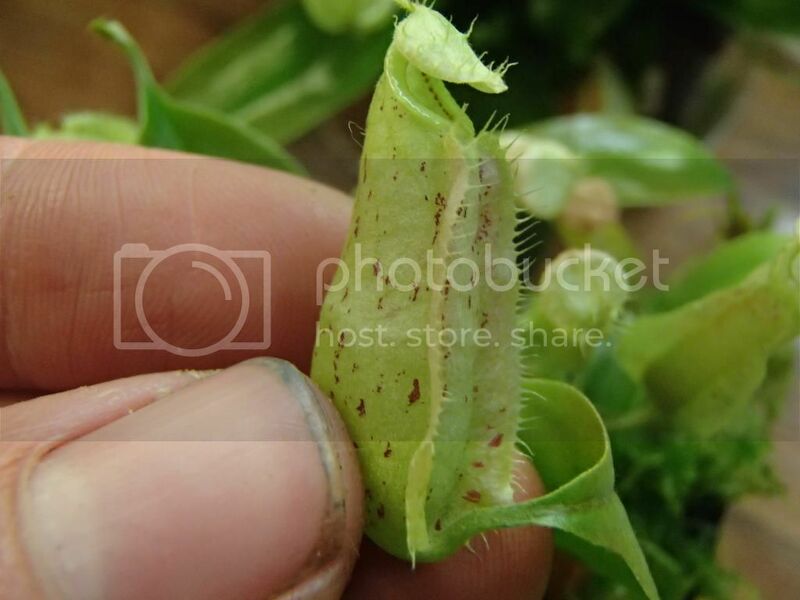 Pollen will start to be harvested probably in about a month, maybe a little less. 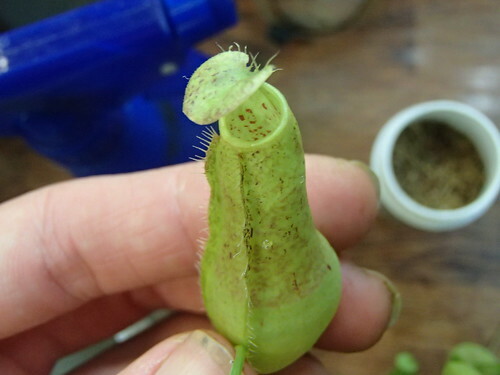 My N. 'Rokko' Exotica is also flowering, and at first I thought it too was male, but the pods are elongate so I believe this may well be my second ever female! 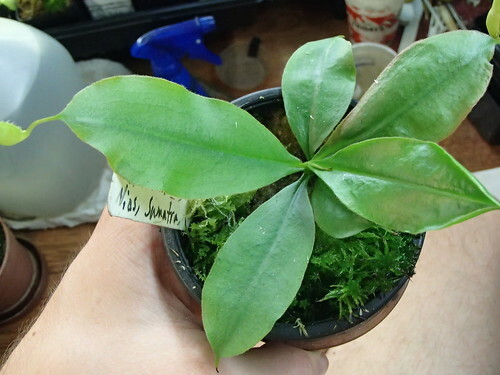 I plan to cross it with at least N. x mixta and the inermis hybrid, as I have pollen of those, but I'd love to cross it too with something far more exotic. 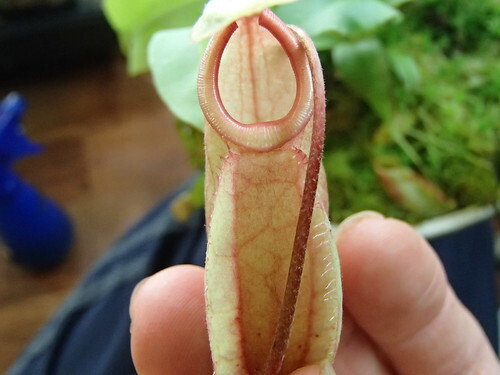 Unless they go through some sort of transformation, I think you have N. mirabilis. 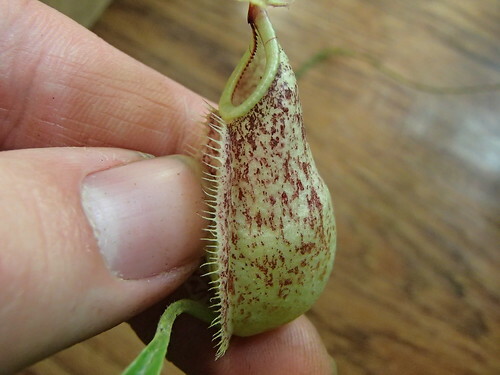 I rather doubt this could even be the hybrid between N. mirabilis and N. echinostoma. 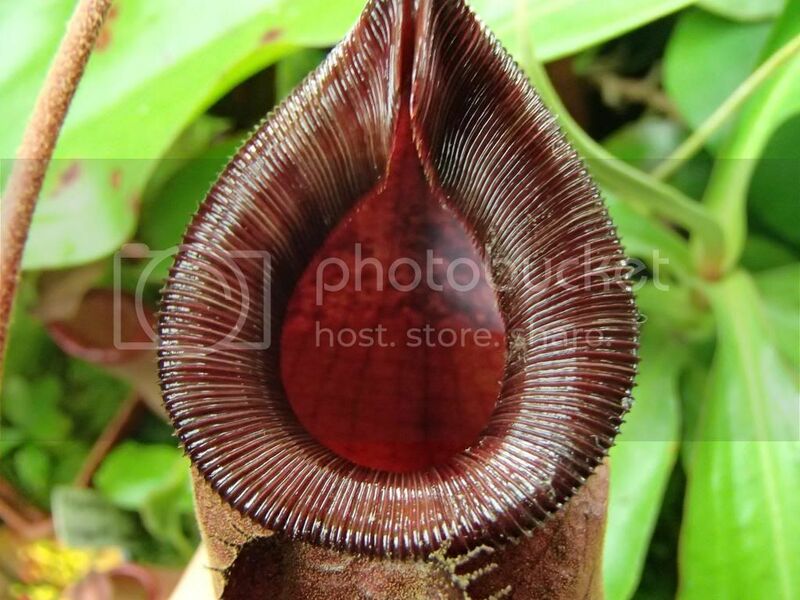 Last I heard, N. mirabilis echinostoma had never been described officially as a separate species....though it probably should be.